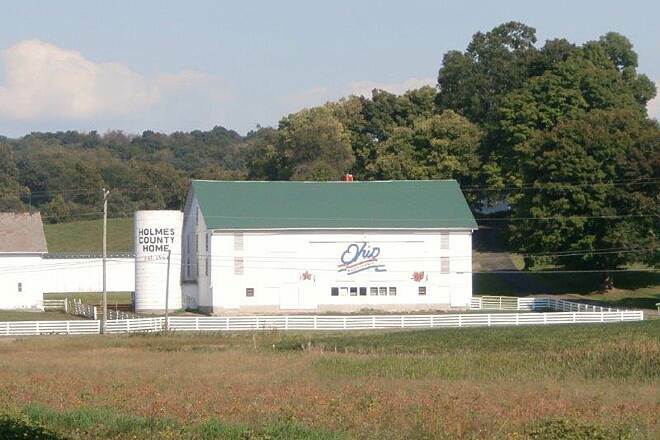 Holmes County, located in northeastern Ohio, is the heart of the state’s Amish country. 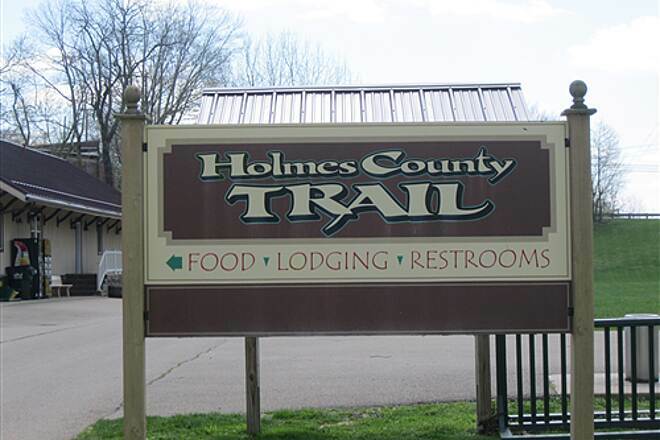 Visitors to this rural enclave will find meandering country roads and bucolic natural areas, as well as the scenic Holmes County Trail. 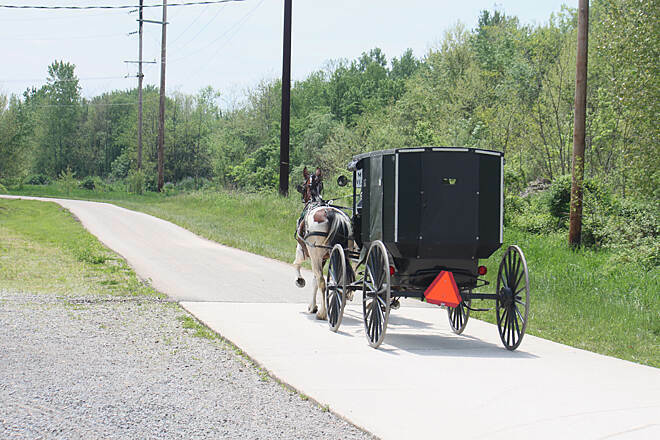 The path was the first recreational trail in the country designed to accommodate Amish buggies, and throughout much of the route it is just as common to pass a horse-drawn buggy as it is to pass a cyclist or walker. The trail is currently open in two disconnected segments. The more southern of the two sections opened in late 2017 and stretches 7.3 miles between Gann (also known as Brinkhaven), at the border with Knox County, and Glenmont. 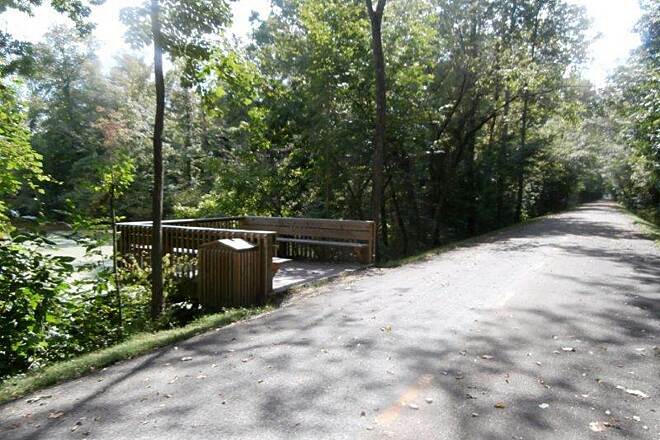 At its western end, you can pick up the connecting Mohican Valley Trail, which heads towards Danville. 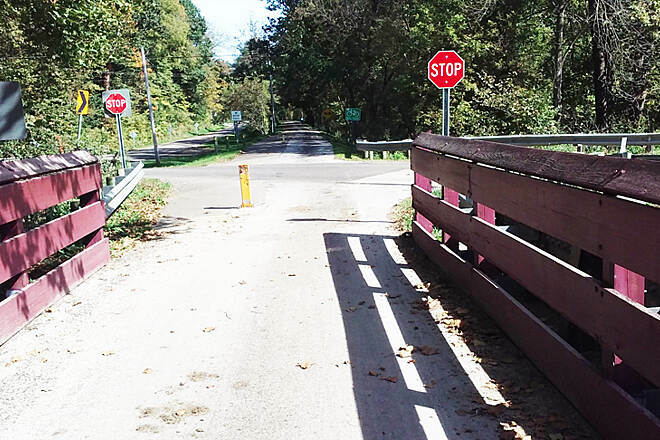 If you travel east on the Holmes County Trail, when you reach the end in Glenmont, you'll have a gap of just over 7 miles to reach the next section of trail in Killbuck. 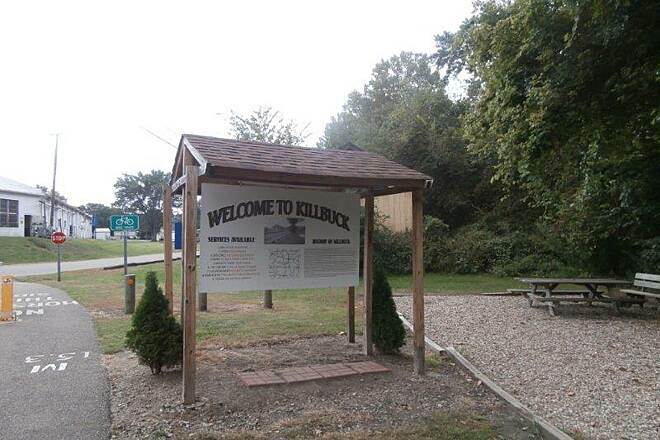 At the Killbuck trailhead, you'll find picnic tables and benches. The paved route, which continues for 15.7 miles north, has an adjacent path for equestrians; be sure to review the etiquette rules posted at the trailhead so you can share the trail safely with its myriad users. 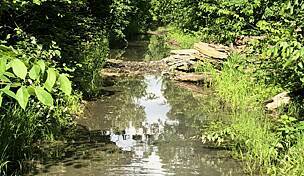 As you travel north, follow the Killbuck Creek as the path traverses wetlands and long cutoff channels of the creek. 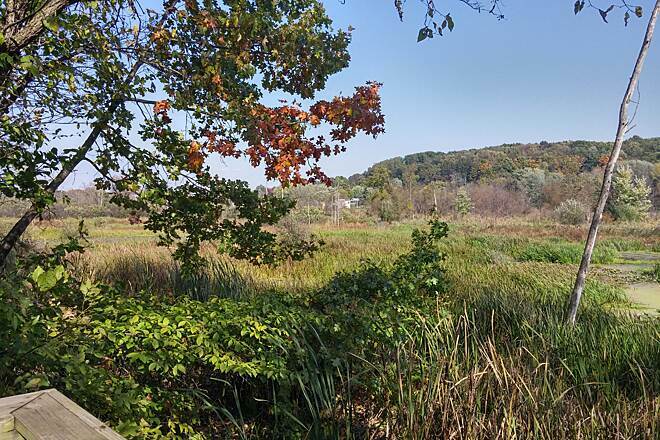 Immerse yourself in the tranquil surroundings before reaching Hipp Station in Millersburg. 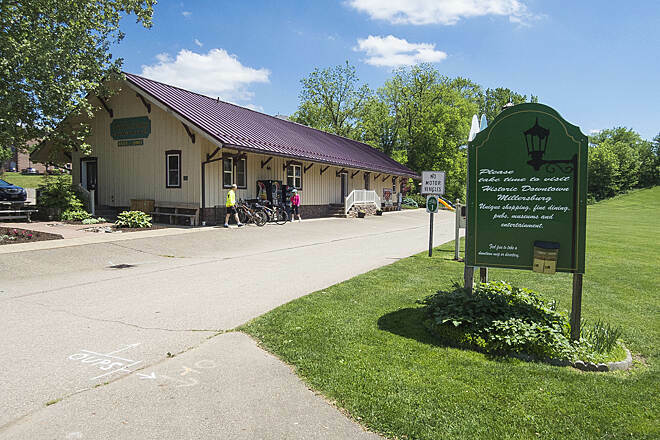 Here you will find a beautifully restored historical train depot, which serves as the trail’s headquarters with a visitor center featuring wildlife displays, trail information, restrooms, vending machines, a covered picnic area, and a playground. 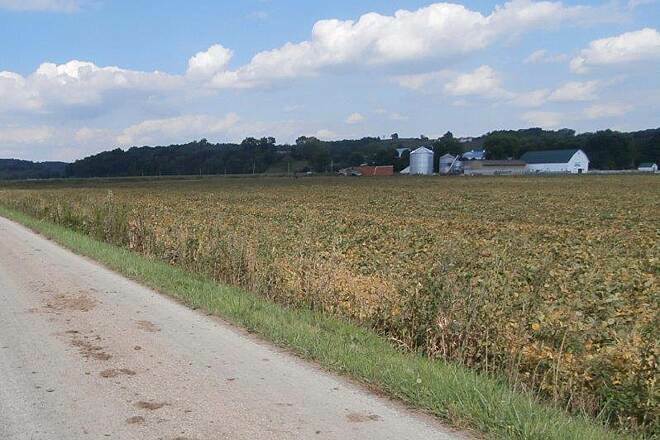 The trail meanders north out of Millersburg at a very easy, even grade. The corridor passes picturesque swamplands for long stretches, and wildlife abounds among the water and trees. You will likely see turtles, snakes, and birds, including cardinals, doves, and hawks. 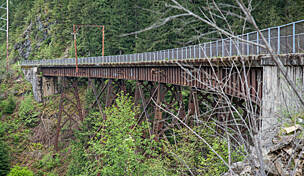 Given the trail’s wet terrain, there are numerous stream crossings, including a couple over restored railroad bridges. 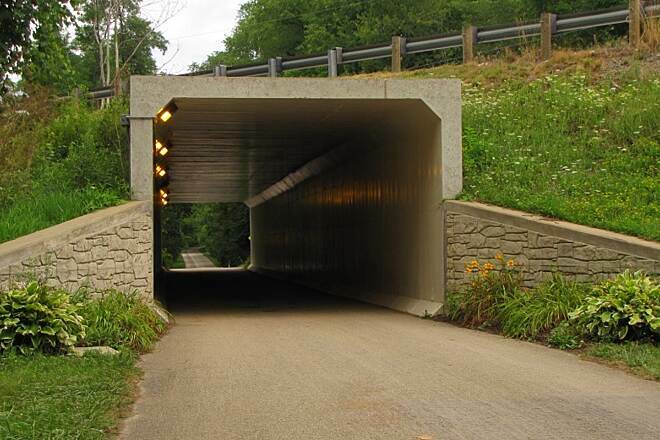 A well-designed square tunnel takes you underneath OH 83 at mile 6 just before the small town of Holmesville. 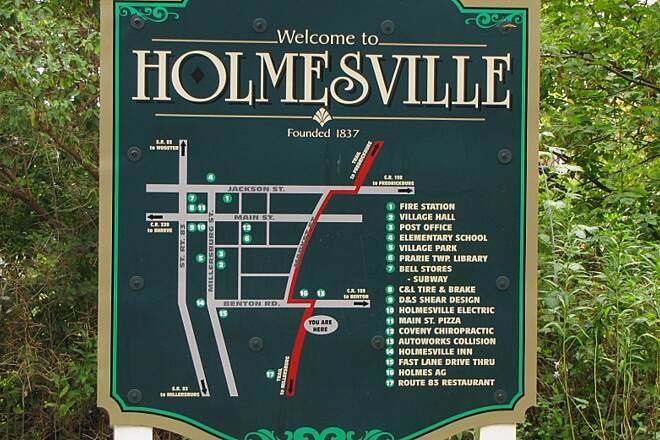 When you enter Holmesville, you will follow quiet community streets about 1 mile until the rail corridor picks up again. The bypass is very well marked, and the streets are little used and easy to navigate. 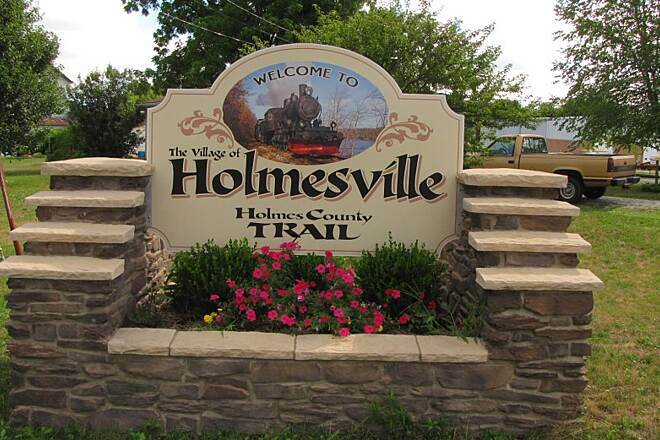 Once through Holmesville, the trail continues another 4 miles along a wonderful mixture of farm fields and tree-lined streams to the Fredericksburg trailhead and the trail’s north end, where you will find restrooms. 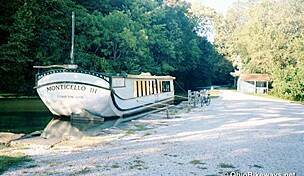 The trail began its life as a spur of one of Ohio’s earliest railroads, the Cleveland and Pittsburgh, and the tracks reached Millersburg in 1854. 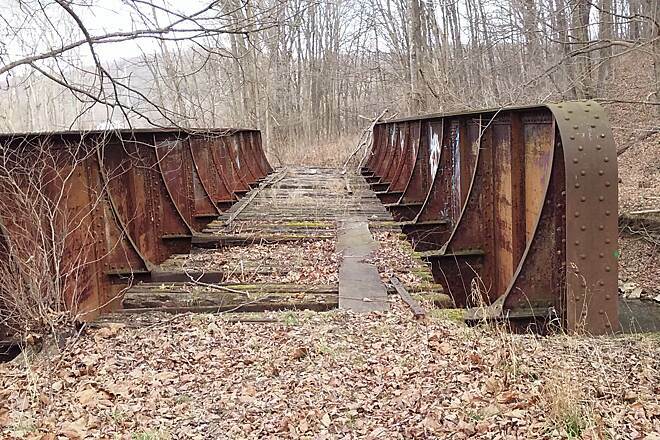 A catastrophic flood in 1969 washed out sections of railbed, leading to the end of the line’s use. 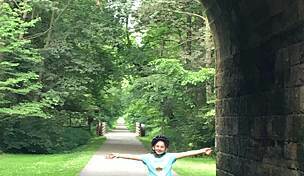 Fortunately, with the conversion of the railway to a rail-trail, which opened in 2005, a new generation of users—bicyclists, walkers, in-line skaters, and horse and buggy riders—can now roll along this picturesque corridor. 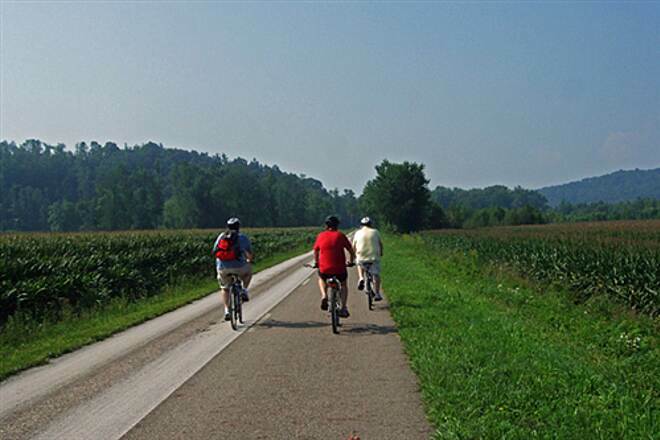 The Holmes County Trail is also a vital component of the Ohio to Erie Trail, a developing 320-mile route, which will eventually span Ohio from the shores of Lake Erie in Cleveland to the Ohio River in Cincinnati. 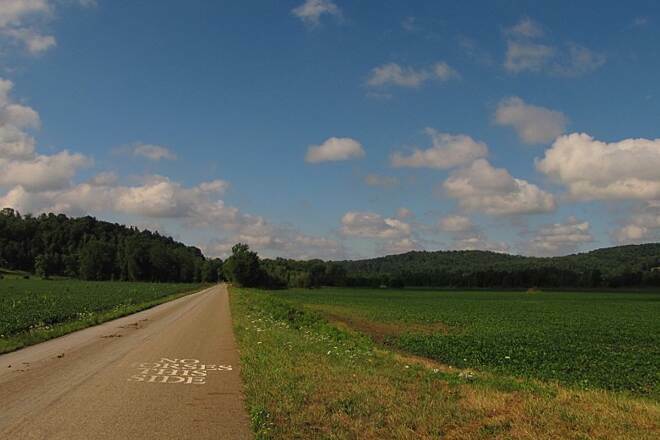 To reach the southern trailhead in Killbuck: From I-77, take Exit 65, and head west on US 36. In 18.2 miles, turn right to remain on US 36. 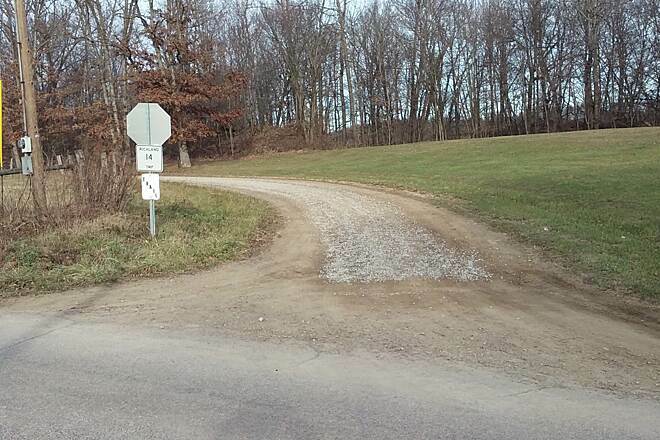 In 6.3 miles, turn right onto OH 60. 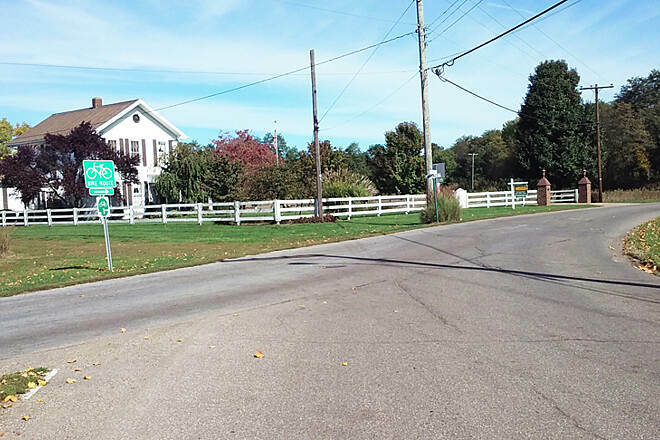 Go 14.3 miles, and turn left then right onto Amish Country Byway, which becomes Main St. and County Road 622. 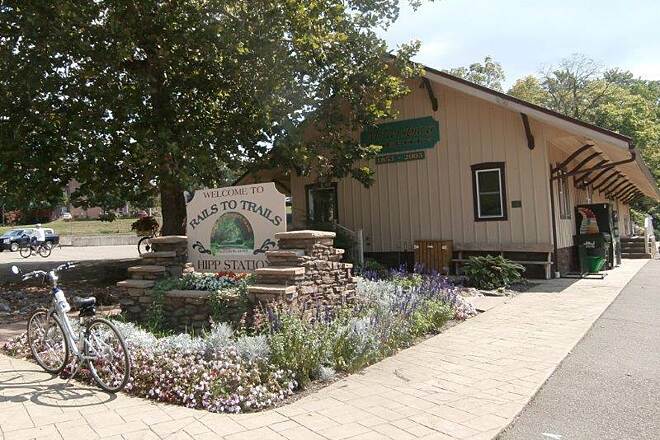 In 1 mile, find the trailhead on your left next to a former train depot. 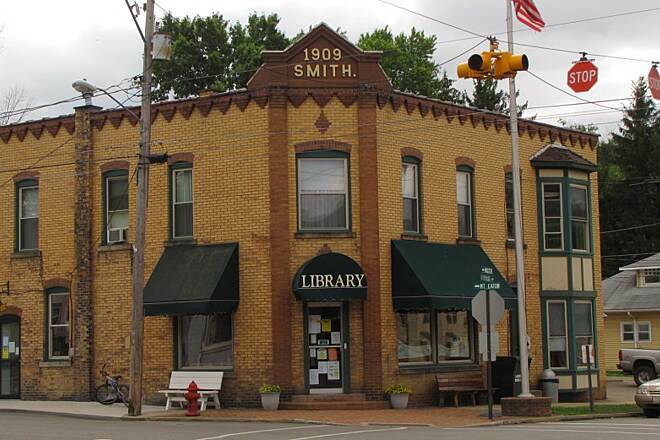 Parking is available in downtown Killbuck on Front St., Water St., Main St., and north of the depot on CR 622. 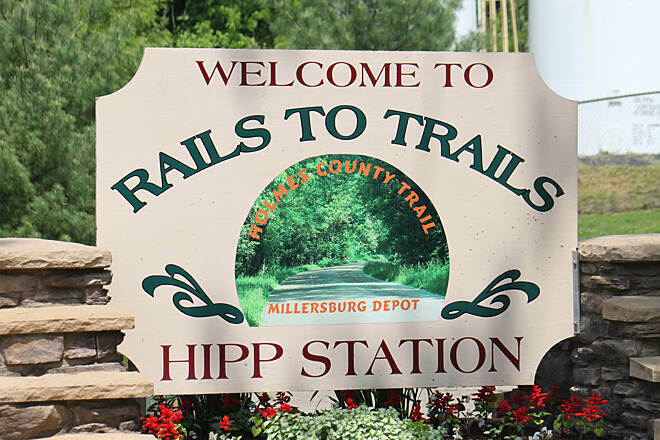 To reach the Millersburg trailhead at Hipp Station: From I-77, take Exit 83 and head west on OH 39, which merges with US 62 and Jackson St. In 25.4 miles, turn right onto N. Grant St., follow it 0.1 mile, and then head west on W. Clinton St., which dead-ends at the Hipp Station trailhead. 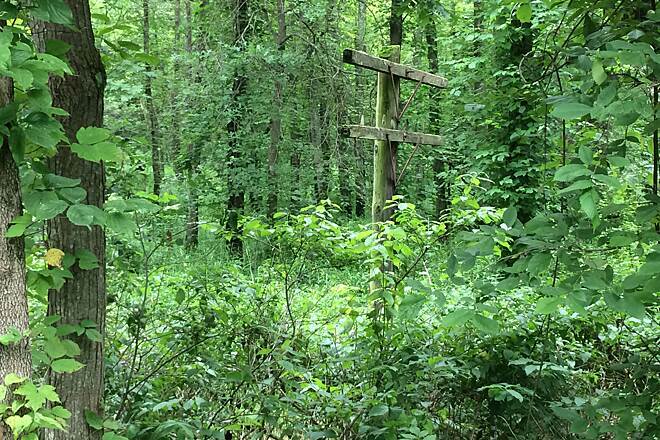 To reach the Fredericksburg trailhead, from I-77, take Exit 87 and head northwest on US 250. In 3.2 miles, turn left to remain on US 250. 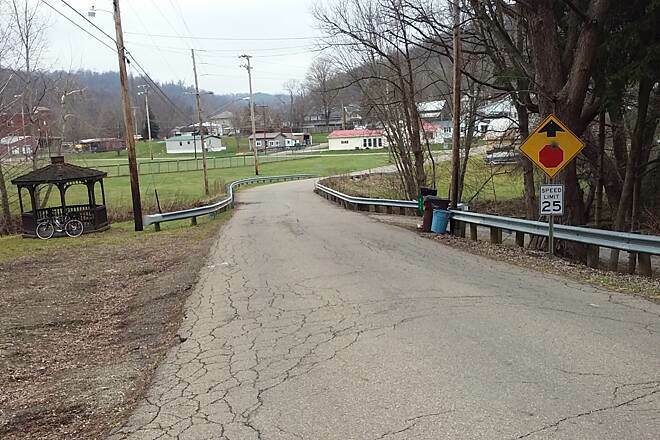 In 10 miles turn left onto Harrison Road, which becomes Clay St. in town, and go 9.2 miles. 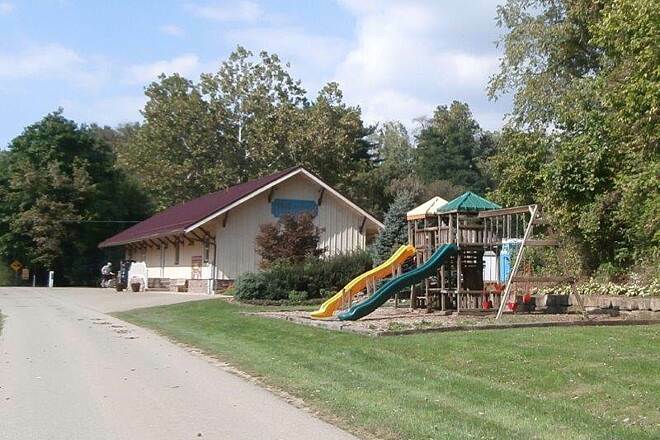 Find the parking lot just past the elementary school next to the bridge and pavilion. 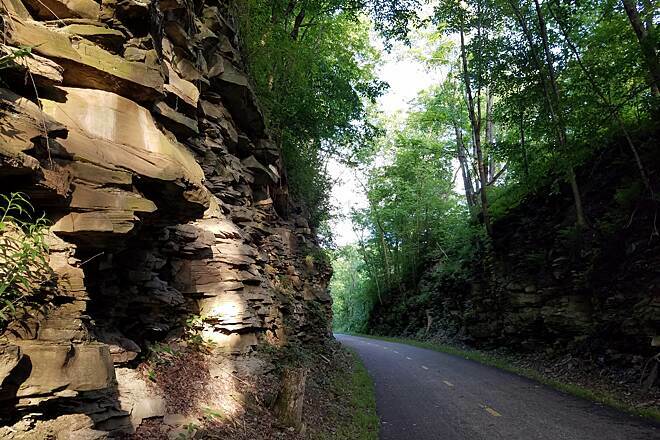 June 2018 - 3/4 mile from the Bridge of Dreams to the Holmes County trail start through the tunnel under Rt. 62 is... barely paved. Very poor condition, but you can get through. After that, it's a whole new world. Fresh pavement the whole way, fencing, plank railing enclosing the high bridges. Very quite, remote ride through mature forests. Long gradual incline and steep short incline mid trail and then short steep decline and long gradual descent into Gann. Port-o-John at Gann. Covered Shelter. 3.8 miles from Danville to Bridge of Dreams. 8.2 from there to Gann. 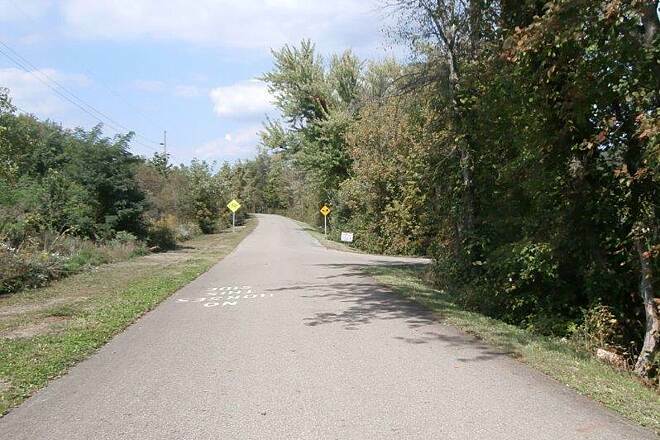 The Holmes County Trail is part of the Ohio To Erie Trail trans-Ohio Route. I have ridden this trail several times. 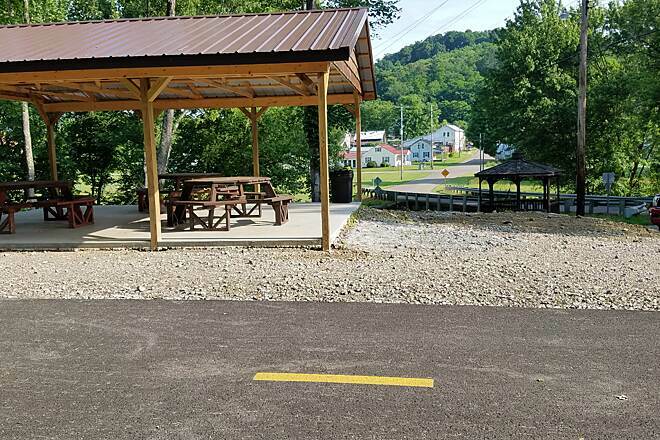 The southern section is a great addition as it takes cross Ohio riders off of the very busy U.S. 62 which one previously had to navigate as part of connecting the Mohican Valley Trail from the Bridge of Dreams to the northern section of the Holmes County Trail in Killbuck, OH. 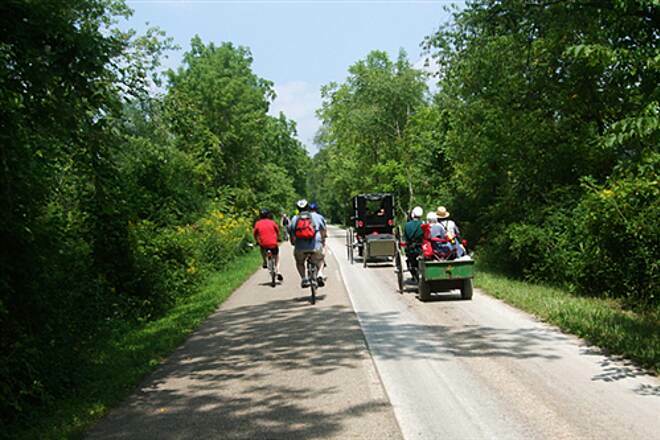 The trail north out of Killbuck is a wide paved path designed to accommodate both cyclists, pedestrians and Amish horse-drawn buggies. 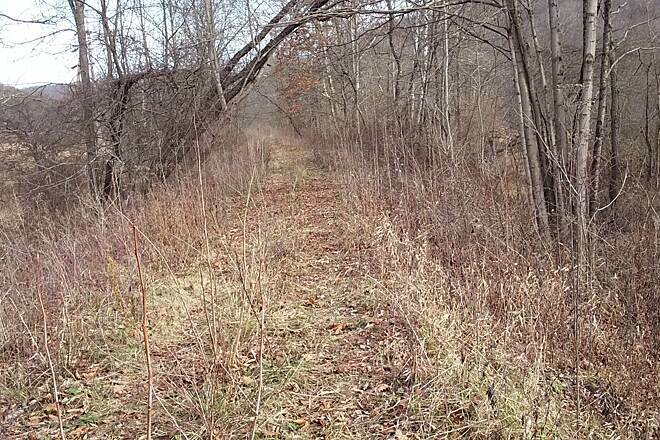 All that is needed is the gap between Glenmont and Killbuck to be completed and this will be a 5 star trail. 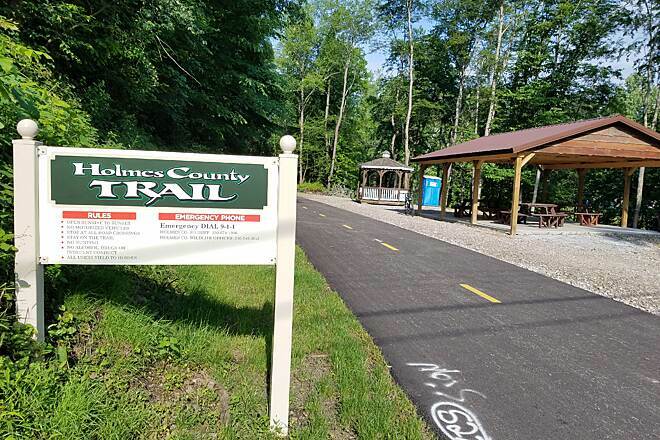 The Holmes County Trail from Glenmont southwest until it meets the Mohican Valley Trail is now fully paved and is a very nice section of the trail. This section does not presently appear on the map. 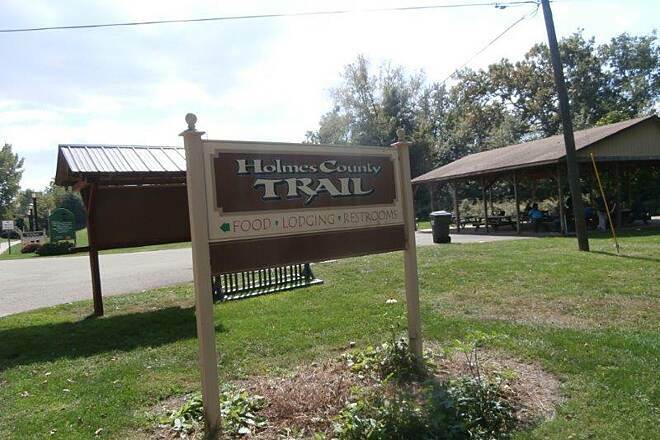 I biked the southern most (new) section of the Holmes County Trail from Brinkhaven (where it connects to the Mohican Valley Trail) to about 1.5 miles short of Glenmont. The trail is nicely paved (10' wide). There is only 1 at road crossing. There are 3-4 roads that we go over high on a bridge. Fencing is being put in along the trail. No railings or fencing at this point on the overpasses of the roads. They're replanting grass along the trail. This is a nice shady trail. 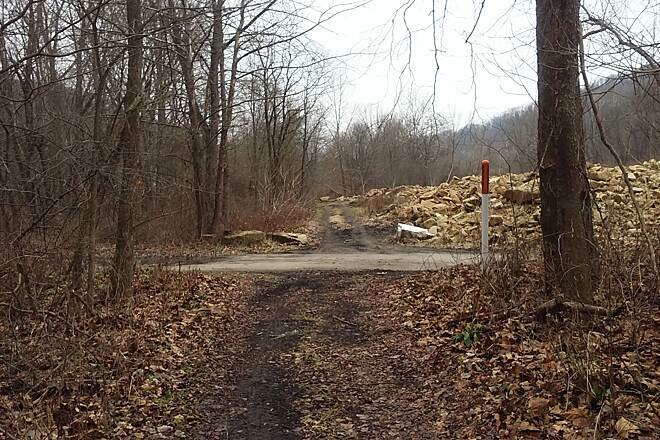 Also for those that start this trail at the "Bridge of Dreams Trailhead", they have repaired the driveway from Hunter Road going up the hill to the parking lot. Attempted to bike this trail today. I had read on another web site (can't remember where now) that the trail was 80% complete as of June 14 2017. I thought I would be safe to ride today. 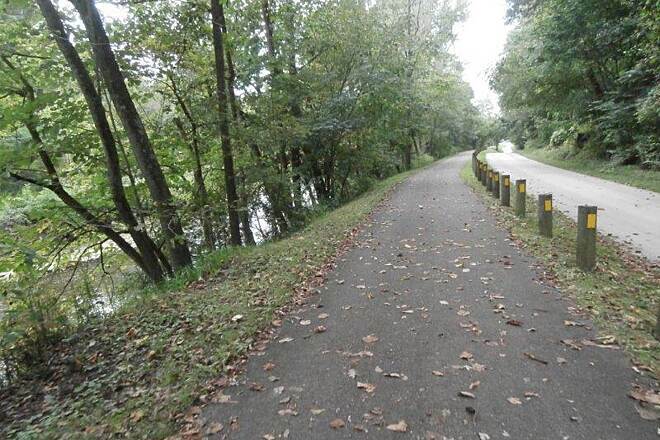 The trail is beautifully paved from the Rte 62 underpass where it connects with the Mohican Valley Trail. The trail is not completely paved into Glenmount but is supposed to be done this year. They have painted the trail over passes a beautiful white. They were working in at least 4 different sections today with dump trucks going up and down the trail. You might be able to ride this on the weekend when they're not working. I will attempt it again in a month or so on a weekend. What a beautiful trail this. We rode this on the 4th of July; starting in Fredericksburg. They were having a large celebration in the park as we pulled in and parked. We rode to Millersburg and back. It was an easy trail and fun. The other riders on the trail were very pleasant and friendly! The celebration was still going on at the park! Easy to access! I really liked the peace & quiet of this trail. Few people and the wider trail made it nice to ride. Seemed easy enough to ride especially for a first-timer, relatively flat, pretty scenery, lots of tree cover, and lots of horse poo to dodge (but it was no big deal). 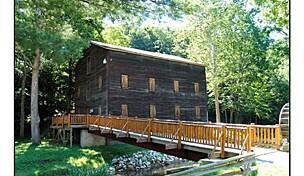 We did Fredericksburg to Millersburg and back.. Plan to return to finish the route to Killbuck. My wife and I bicycled this trail from Millersburg to Fredericksburg (about 20 miles round trip). The trail is all asphalt and basically flat. It was an easy ride with lots of nice scenery. 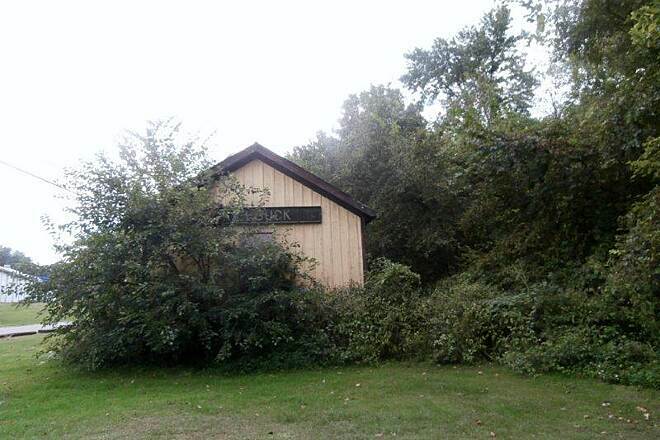 There are facilities at Millersburg, Holmesville and Fredrickburg, so you're never far from a rest room. This trail is typically 16 feet wide, with half of the trail dedicated to buggies and the other half dedicated to pedestrians and bicyclists. Because of the buggy traffic, we encountered the casual pile of horse apples, but it was very infrequent and not a distraction. We would recommend this trail to anyone. Can't complain much. This is one of my two "home" trails. For the people who complain about the road apple, buggies have to pass each other too, and you can't ask a horse to hold it! Deal with it. 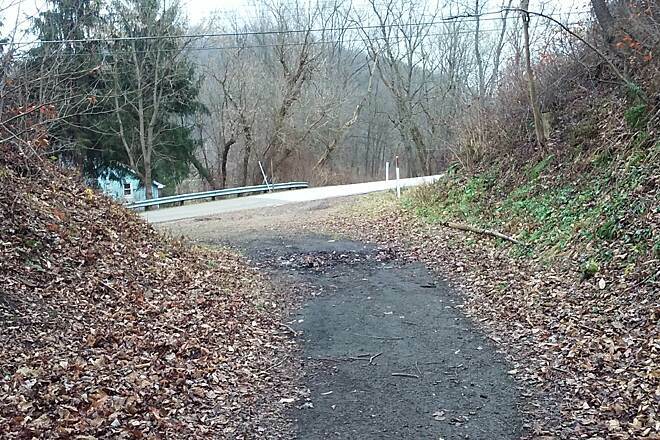 There is a short section below Holmesville that needs repair, and has been marked for a few years. As of 2016, there have been some "blade patch" done. Beautiful trail with great birding opportunities. Today we saw a pair of sandhill cranes, a redheaded woodpecker, and wood ducks to name a few. Bring your binoculars if you are so inclined. 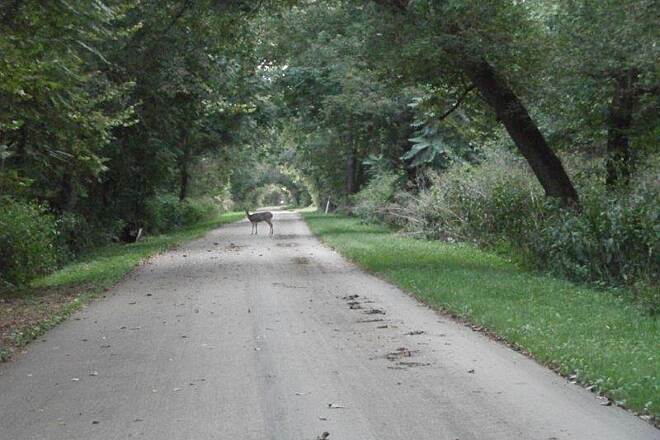 Each season must provide great wildlife viewing along the trail's variety of terrains. We are anxious to return in the spring. Minor rough spots were marked for repair in the 26 miles we biked. Be alert for walnuts on the tail surface in the fall. We passed a maintenance man on a tractor blowing leaves off the length of the trail. Trail users were friendly and courteous. Be prepared for weather conditions. 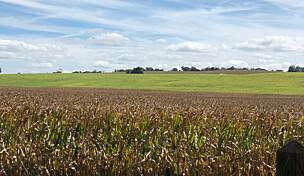 Although much of the trail is shaded, winds across the large cornfield areas can be strong. 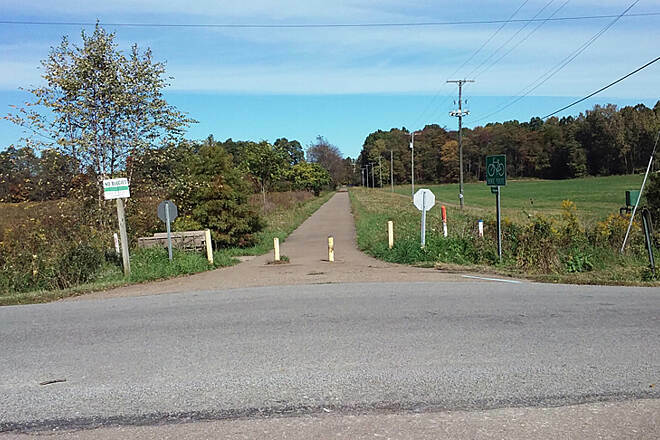 A Walmart parking lot is directly linked to this Amish trail. The trail shows its age in some areas where root systems or seasonal freezings are starting to add a "speed bump" effect. You'll find benches and refuse containers right where you need them. 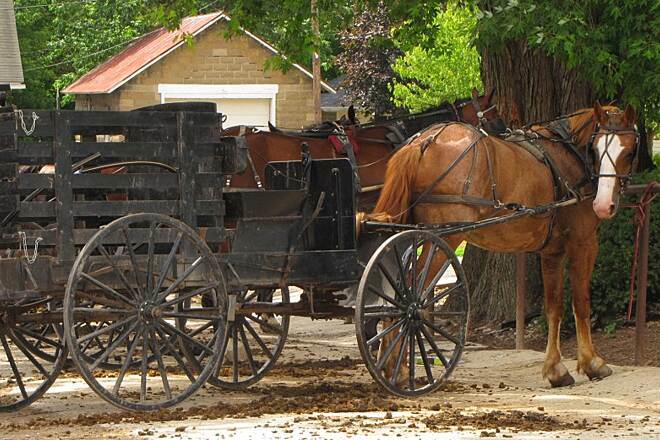 Restraints, Amish shopping, or more modern convenience stores are found in many places along the trail as well. Nice trail. It is a shared trail between the Horse and Buggies and regular trail users. By the location of horse droppings it is obvious that the Buggy drivers do not follow the rules and etiquette of the trail. Horse and Buggy traffic is supposed to use one side of the trail and keep that same side no matter what direction they are traveling so as to keep the other side clear for those walking, running, riding bikes or skating. Aside from the horse messes the trail is nice with good views, mostly flat and plenty of restrooms and relaxing places along the way. 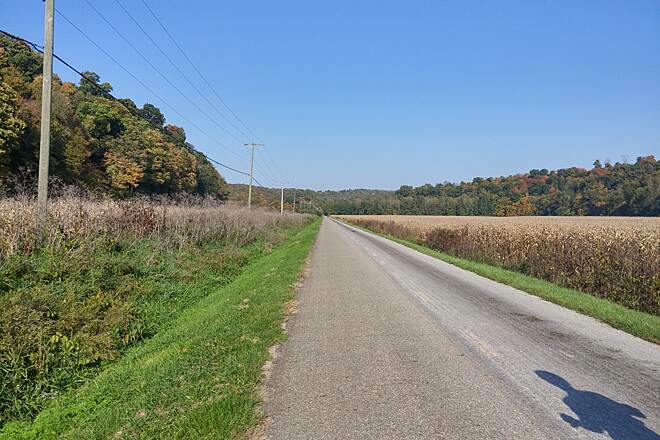 Having biked the northern segment several years ago, I wanted to try the newer southern stretch from Millersburg to Killbuck. 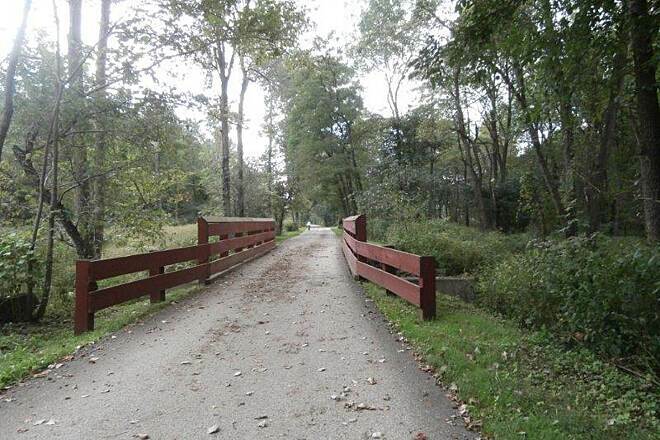 It is a very flat, level, woodsy, heavily shaded, and smoothly paved 6.3 mile route. Nothing exciting to see along the trail, but a pleasant, fast ride. I then went up a little way past Holmesville. That's more of an upgrade, and more interesting. 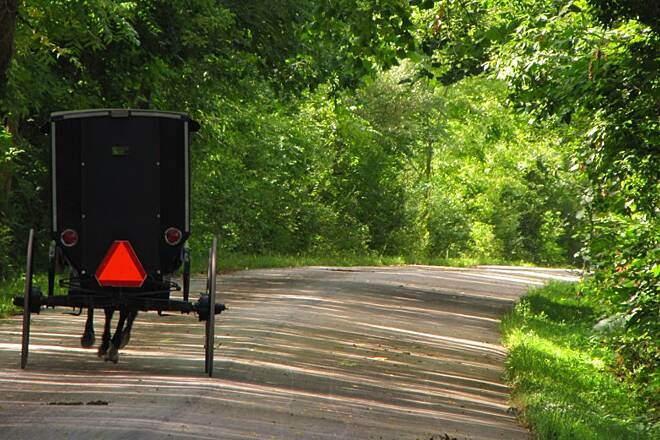 Passed a number of Amish buggies on their side of the trail. There's a stretch of root-fractured pavement just below Holmeville, which appears to be marked for (much-needed) repair. It's bumpy, but certainly manageable. 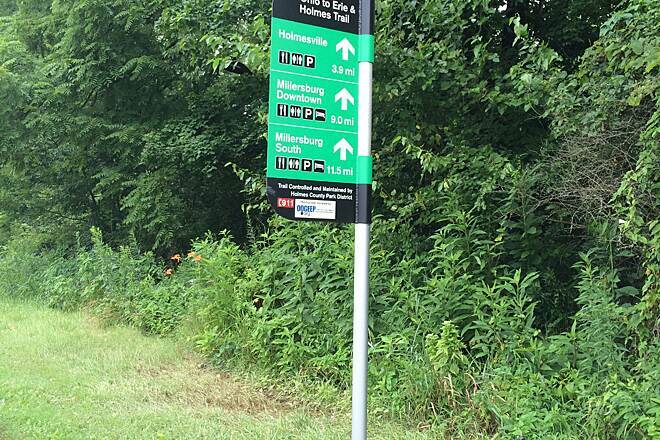 I'm amused by the paired trail signs with bike and buggy images. Overall it was a fairly fast 25-mile round trip, centered at Millersburg, where there is good parking and trail access. I hope to do this trail again when I next travel through Ohio. this was a nice ride. there were a few rough spots but they appear to be marked for repair. the trail seems mostly shaded [80% my guess]so that helps with the heat. it would be better if people would clean up after their animals [especially the horses, the horses are restricted to one side of trail, to no avail they crap all over. this trail is a great ride but those that mess it up and dont clean it up drop the rating! 1down for crap 1 down for rough spots. killbuck sweet shop sure had some nice looking food i just had some ice cream. it is a great ride just keep a look out for used horse food resadue. 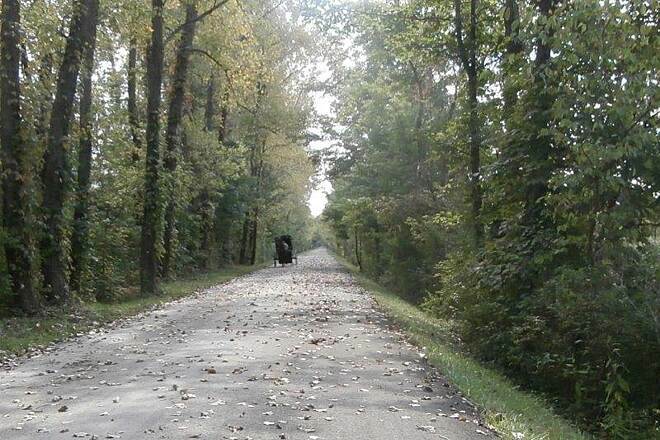 We rode this trail from Fredericksburg to Killbuck mid-September. And back. The trail is very flat, and very fast. 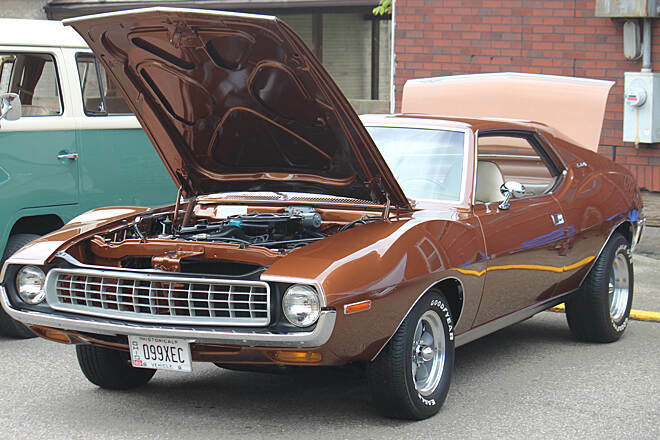 You could clip right along. In Fredericksburg, there is a parking lot next to the Elementary school. 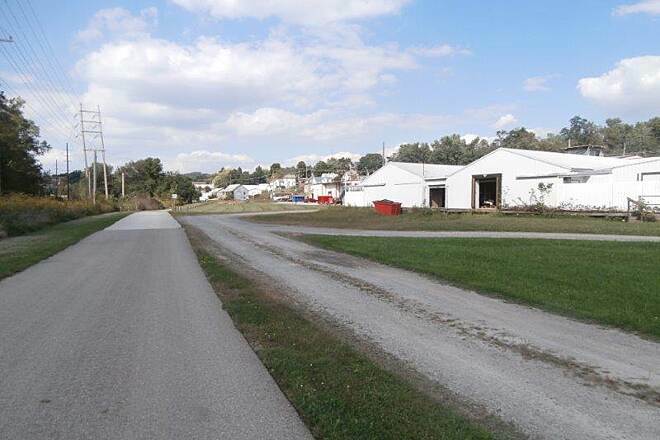 A gravel lot with a picnic shelter there. In the back of the shelter are flush toilets. 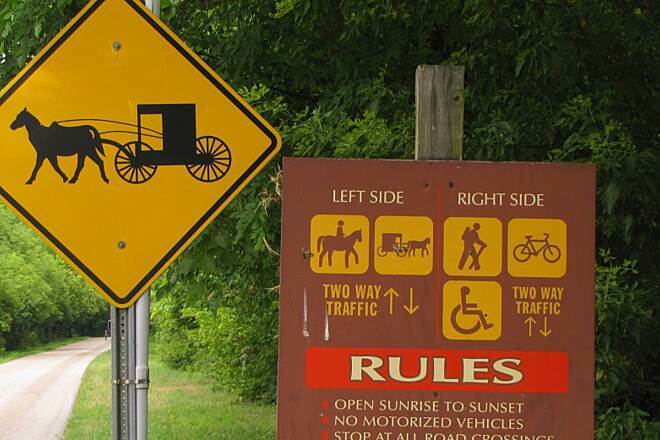 The trail is shared by Amish buggies. 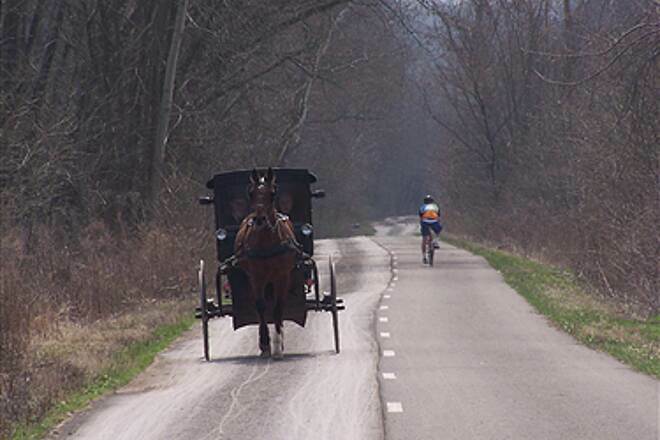 The Amish turnpike runs along side of this trail. However, sometimes the buggies appear to be on the bike side as I noticed several piles of horse poop. So just dodge the poop and you will be ok. We saw some buggies on the trail. 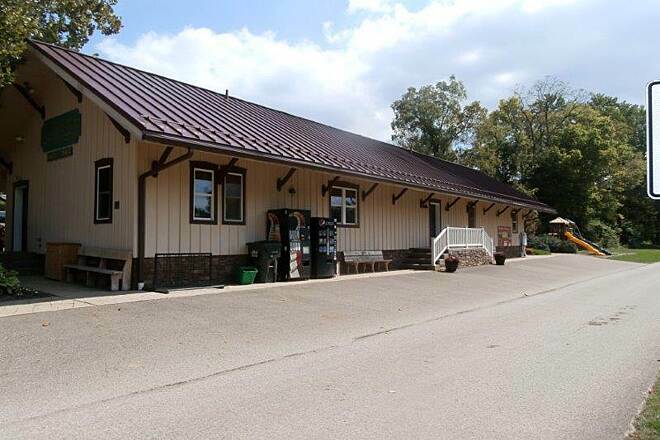 Nice train station/ parking/ and pavillion in Millersburg. Also trail access to Wal Mart and McDonalds. 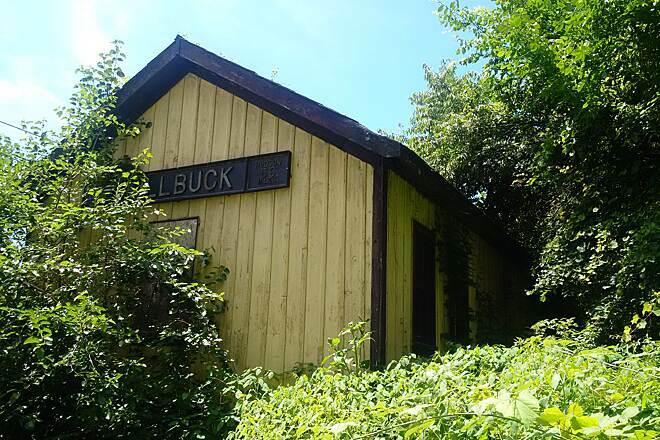 The former Killbuck train station is among weeds. 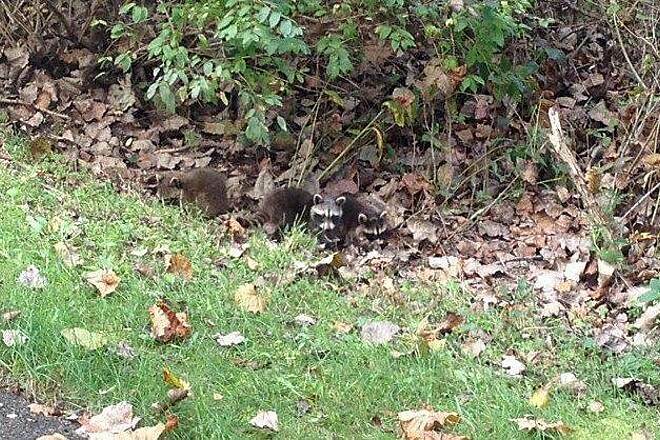 Along the trail we saw baby raccoons and a deer. Photo's posted. All in all this is a great trail. We rode this trail on a hot day in July and really enjoyed it. It was beautifully paved and we had a chance to pass through several small towns. 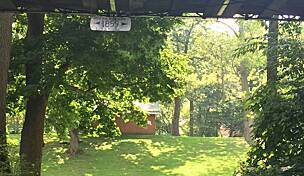 The trailhead in Fredricksburg is just over the bridge from the parking lot - you can't see it from the parking lot. We rode from Fredricksburg to Killbuck and enjoyed every mile. Millersburg had a beautiful park at the trailhead for a nice break in the middle of the trail. 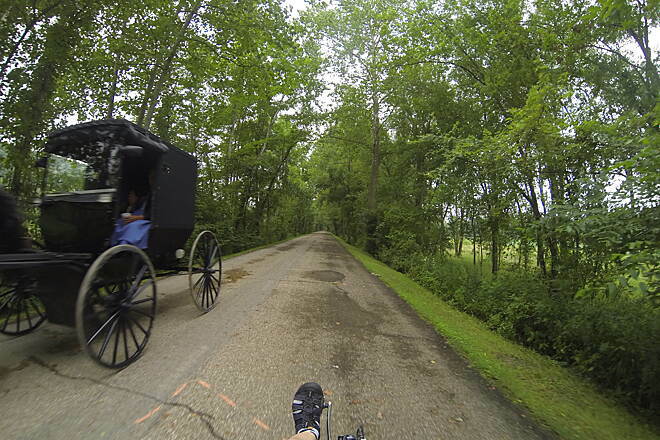 What an experience to peddle alongside horse & buggy. Trail is relatively flat and scenery is just beautiful. Pavement in good shape and there are horse apples but to be expected. Picnic tables at end of trail in Killbuck and other dining options. Facilities in Fredricksburg are the only ones until you get to Killbuck which has 2 porta pots. Just an awesome trail. What a perfect experience! 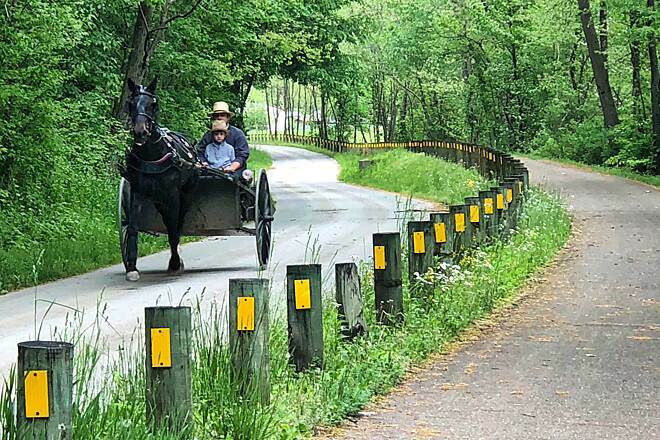 It was so neat to share the trail with horse and buggy as well as ride through some of the most scenic countrysides in Ohio. 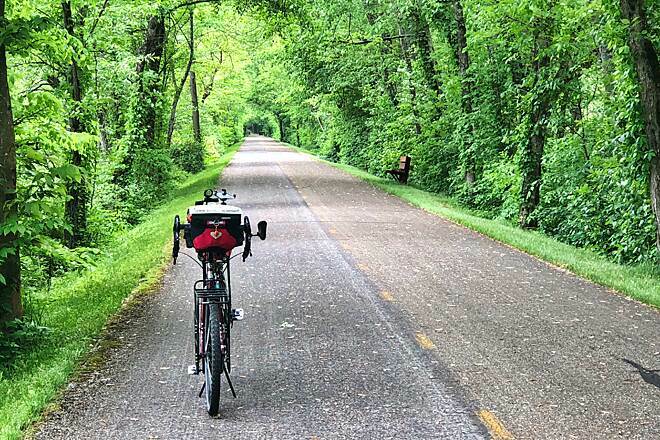 This is rail trail riding at its best. The asphalt surface is very smooth and very flat; no real hills to speak of. 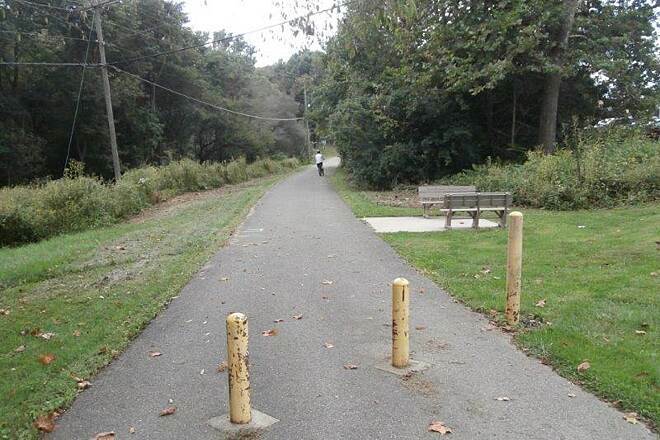 This is also a perfect trail for family rides. Unlike other trails I have been on, the cycling traffic was relatively light for a Saturday afternoon. It took us almost two hours to get to this trail but it was well worth it! We took Route 62 all the way to Danville and then came upon a detour. The detour took us quite a bit out of the way, but the drive was breathtaking! Beautiful winding roads and rolling hills, all the way that, at times, were a bit unnerving driving up and over the tops of them.....like a roller coaster!! 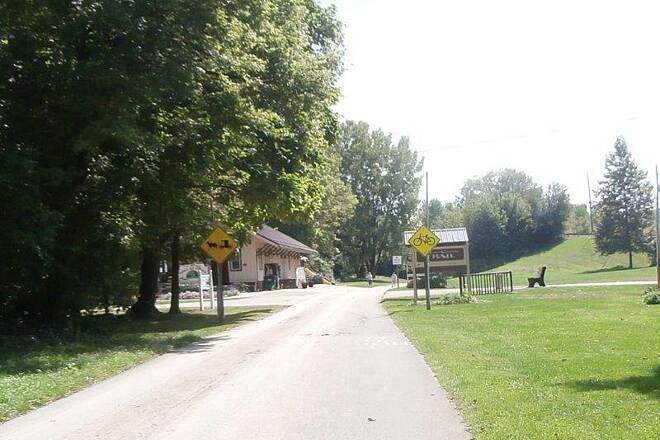 This part of Ohio is heavily Amish (in fact, this area has the highest population of Amish in all the world! ), which made the experience so much more interesting and charming. We began our ride in Killbuck and ended in Fredricksburg. The trail is a canopy of trees most of the way. It's well paved and wide enough for cyclists and horse and buggies to move comfortably past one another. We must of passed at least 30 buggies. Once we got to Fredricksburg we rewarded ourselves with an ice cream cone from Smith's. Delish! We can't wait to do this trail again......you won't be disappointed. 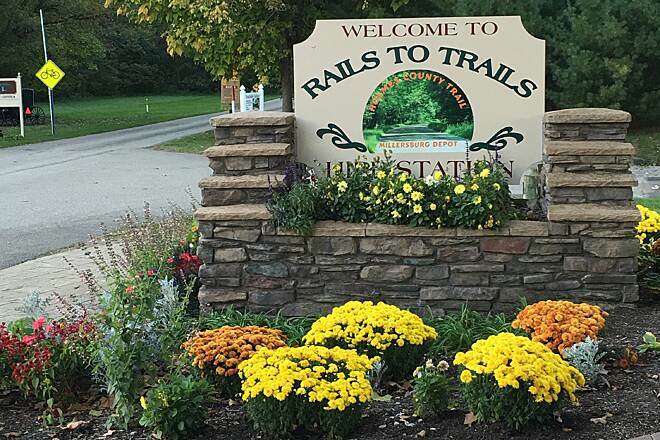 The Wayne County Impact (Biking Division) is proud to announce that the Holmes County Trail has won our award for the "Most Outstanding Rail Trail." This is a very scenic trail. 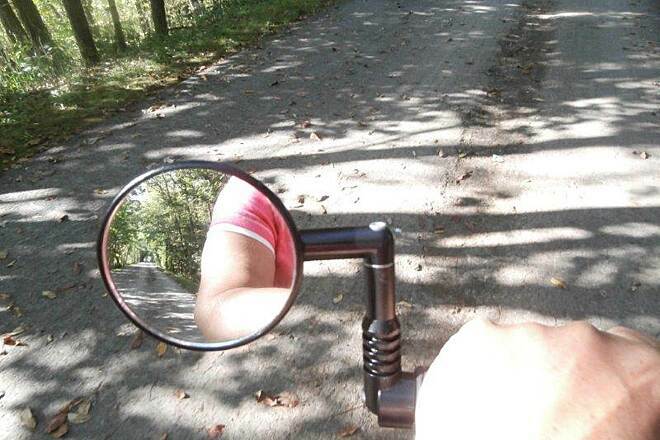 We recommend riding during the fall when the leaves change color. You can't beat it! 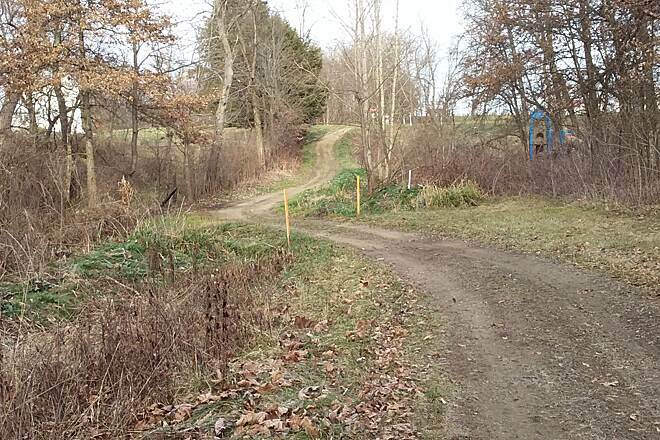 This is a very unique trail with Amish buggies traveling on it. Definately worth the trip to check this most unique trail out! My husband and I rode part of this trail for the first time today and loved it. It's mostly flat, smooth, and has great scenery. We definitely plan on returning! This is an excellent trail! 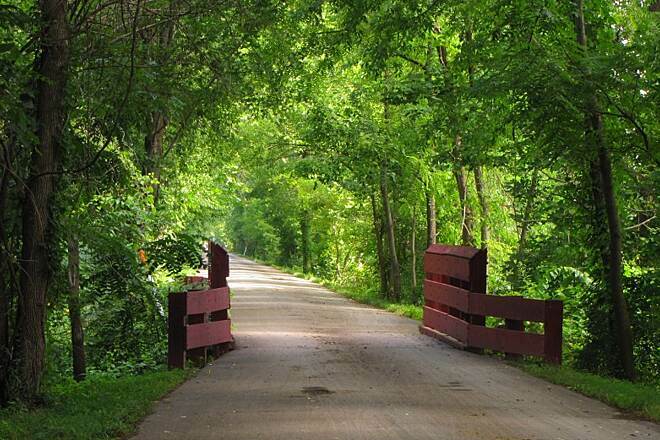 While Ohio is blessed with a great rails to trails program, My top two have always been Mount Vernon to Danville (Kokosing Trail), Corwin to Morrow (Little Miami Trail). Riding the Holmes trail from Killbuck to Fredricksburg is now in my top two!! It is 33 miles exactly per my GPS from the large public parking lot in the center of Killbuck to Lem's in Fredricksburg. It was so neat to eat pizza our front of Lems under a shaded roof and watch the local traffic go by. All sorts of Amish carts and buggies...everyone in town was nice. 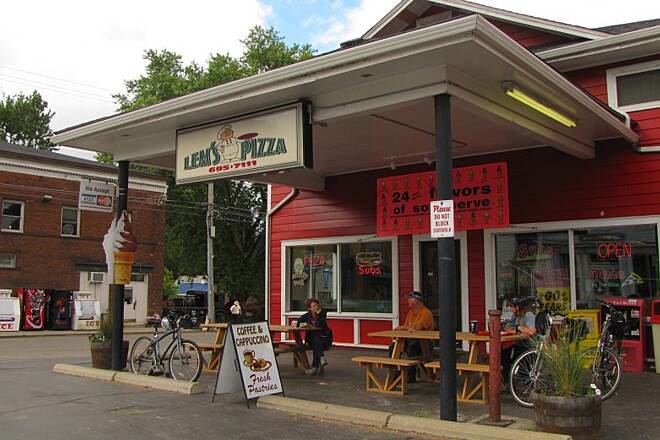 Lems' has great pizza, broasted chicken, subs and 24 (count them) flavors of soft serve ice cream! We never leave any calories behind when we ride Ohio rails to trails!!! 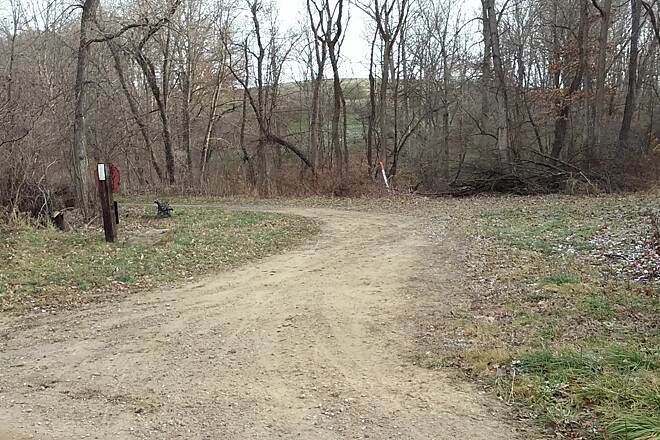 The trail itself is so quite and peaceful, the occasional Amish buggy is nice. My wife and I waved to them all and they all waved back...friendly people. 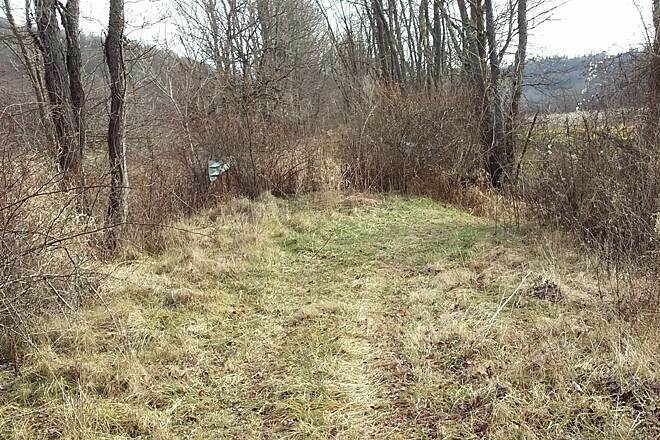 The trail goes through a mixture of woods, open crop lands and marshland. Its mid summer, and we did not have any bug problems from the wetlands. If you like a 33 mile round trip, enjoyable ride with great food along the trail, you will like this one. You can trim about ten miles off it by starting in Millersburg, but I greatly suggest the whole 33 miles! One warning: The section right before Fredericksburg still has an elevation drop between the two lanes (about a inch and a half). 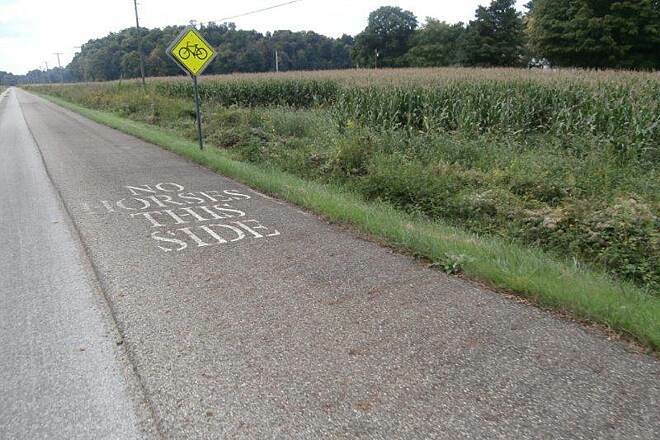 We came across a couple where his wife had a bike accident because of this. She was pretty banged up and bleeding (elbow & knee) from riding off the rim and wrecking attempting to get back on the proper side of the trail. Stay well off to the side of the trail in this section. Its more dangerous then it looks. I had to give you that warning. But this is otherwise a great 5 star trail!! Ride it soon!! I rode this trail from Fredericksburg to Killbuck. The trail was exceptionally smooth, pleasant to ride, and worth a visit. 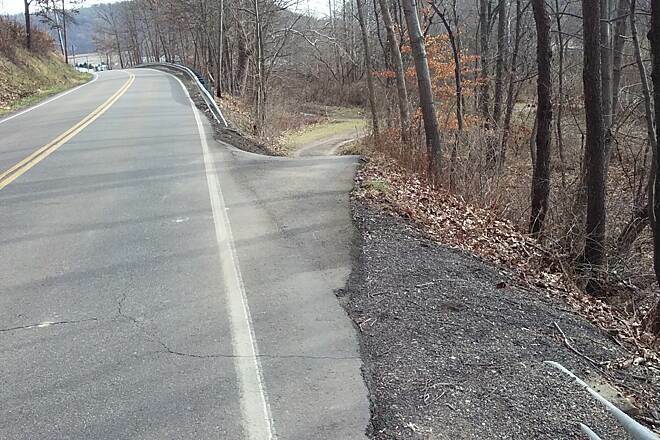 It's in an Amish area, and most of the trail is divided with one half for buggies and one half for bikes/pedestrians. Care is always required when passing horses, but the other trail users were very courteous and allowed me to pass. Fully paved. 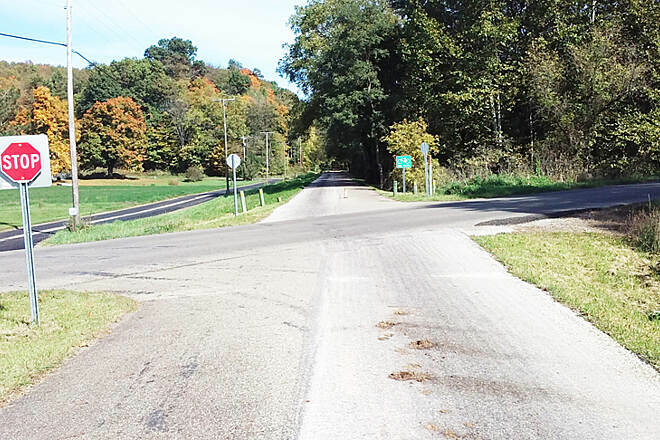 One short section in Holmesville takes you on some quiet country roads, but it was well marked. Rolling farmland and small towns. Trailhead in Fredericksburg is not marked and was a bit tough to find. The parking lot is next to the elementary school/baseball fields, but the trail is across a bridge and not visible from the parking area. I had to ask for directions. There were several outhouses along the trail. Trail should be very easy on a road or mountain bike. It is almost totally flat so it doesn't much matter which end you started at. Bring plenty of water and sunscreen as several sections are totally exposed with no shade. Bug spray would also be a good idea. 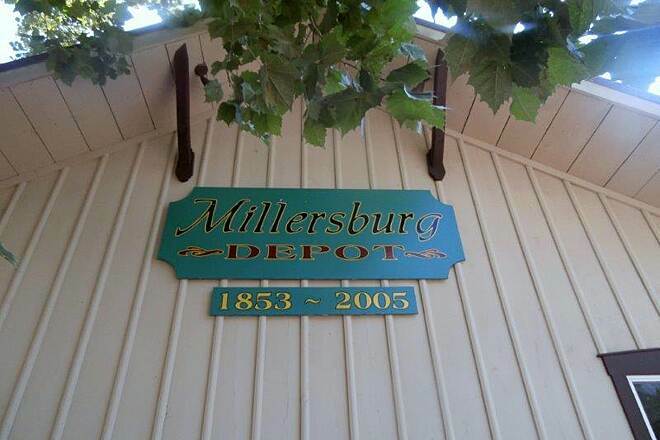 I plan to ride the Millersburg-Killbuck section very soon- maybe today! it was not entirely finished several years ago the when I first rode this trail- Google satellite images look very woodsy and isolated once you pass the Walmart. Restrooms and water are not frequent so take advantage of them when you can. Luckily the Millersburg station is right in the middle of the trail. Millersburg has great little shops to visit- I always antique there even when biking the trail! This is the 5th Rail-to-Trail that I have ridden in the last year or so. With that being said, it is easy to fault all of the little problems with each trail, but I would like to point out the good features about each trail i ride. The first point about this trail is the ease of the ride. This trail is relatively flat and in very good condition. The few potholes that are on the trail have been marked with orange paint and are easy to avoid. 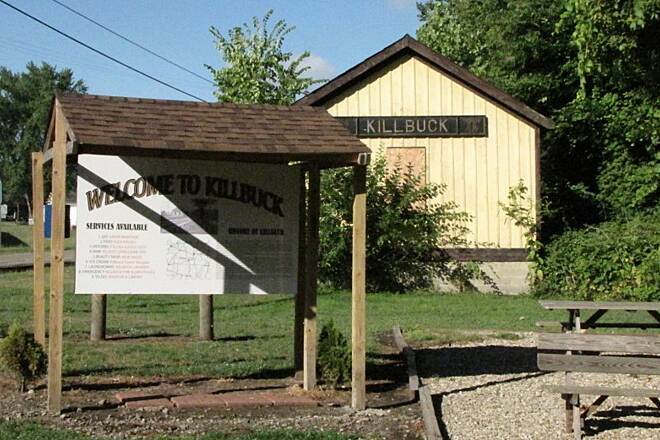 I started my ride in Fredericksburg, rode through Holmesville, Millersburg,and ended in Killbuck. I then rode back to Fredericksburg. The ride is 15.3 miles each way, 30.6 miles total, and I know this because there are pavement markings indicating the distance. That is a nice feature of the trail, especially if you are riding with someone who is always asking, "Are we there yet?" The second nice feature of this trail is the dual paths for bikes and buggies. It was neat to see the buggies coming at me and realize that the buggies are safer riding on this trail than out on the road being passed at breakneck speed by cars and trucks. The "road apples" other reviewers were commenting about were on the buggy side of the trail and not an issue at all. A final comment about the "facilities" along the way. If you plan on starting in Fredericksburg, there aren't any restrooms at the trailhead. 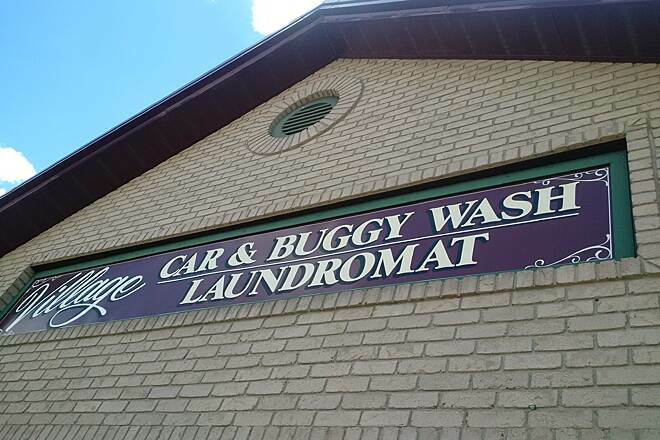 You need to use the restroom in the Laundromat in the center of town. I also found a really neat produce shop (Roger's Produce) right in front of the trailhead. It has great fruits and vegetables at a reasonable price. Roger is also a neat fellow to talk to. He is open weekends. Also, when getting directions on where to start riding the trail, use the Frederickburg Elementary School because the trailhead starts right next to it. There is also a good pizza shop in Millersburg where I stopped for lunch. The steak salad was enough for two people. It was reasonably priced and very friendly. I think this trail is fantastic and would definitely ride it again. My hat goes off to those who maintain it because they are doing a great job. I rode this trail from Fredericksburg to Killbuck and back last week. The trail surface is in very good condition, I did not come across any bumps or potholes at all. Overall I found riding this flat straight trail pleasant but somewhat ordinary. I enjoy riding on a trail that is more a challenge with inclines or at least a few turns along the way. Maybe there would have been more to enjoy during the spring with abudant wildlife or during the fall with the leaves still on the trees. I just felt like I needed something to break up the Monotony. I would also suggest finding a partner to ride with for this kind of trail and stopping at Killbuck for lunch would probably be a good idea too. If you enjoy a nice quiet smooth flat ride at a leisurely pace then this trial is for you. On the other hand, if you ride more for fitness and you are looking for a trail that offers some challanges then you may want to look somewhere else. 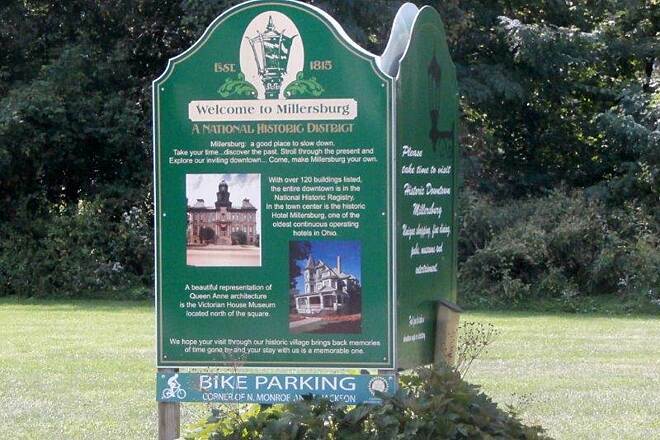 We rode from Millersburg to Fredericksburg, then straight through to Killbuck and back to Millersburg. This trail is one of the most diverse we have ridden so far. 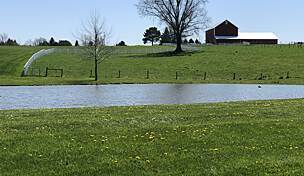 Open fields, wetlands, forest and small towns. Wow. This is why I love Ohio so much! 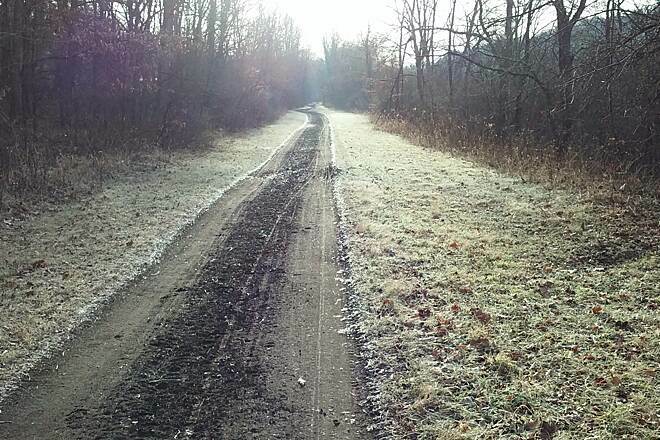 The trail is in great shape from Millersburg to Killbuck. The Millersburg to Fredericksburg section is starting to develop some root damage in a few sections, but nothing serious yet. Since it was midweek, and for many, the first day of school, we pretty much had the trail to ourselves. We did pass a couple of buggies along the way. We just had to pull into the Walmart parking lot to get a picture of the buggy shed there. Overall a wonderful ride on a beautiful trail. I'm looking forward to when the Killbuck to Brinkhaven section is finished! 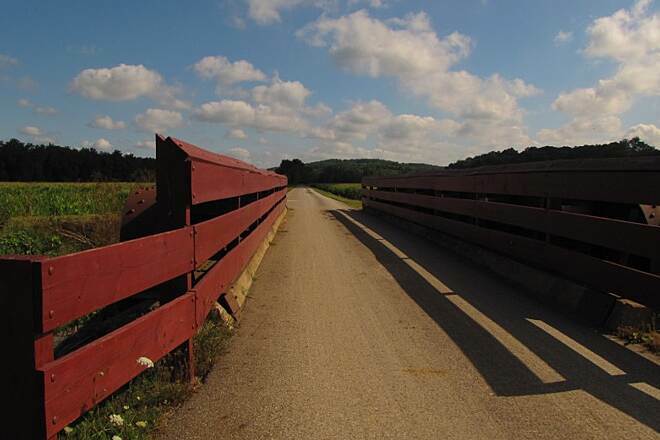 Very nice trail, rode Fredericksburg to Millersburg on 7/22/10, Then went back on 7/26/10 to ride Millersburg to Killbuck. We found the trail quite comfortable, and for the day we were there, a little too sunny in the northern stretch near Fredericksburg. However, the dual traffic was a delight, and met some friendly biker folks at the Killbuck end. Millersburg to Killbuck is mostly shaded. We spent some time in Millersburg, and lunch at the Millersburg Hotel...check out the "happy hour" there too! Greatly enjoyed both days. 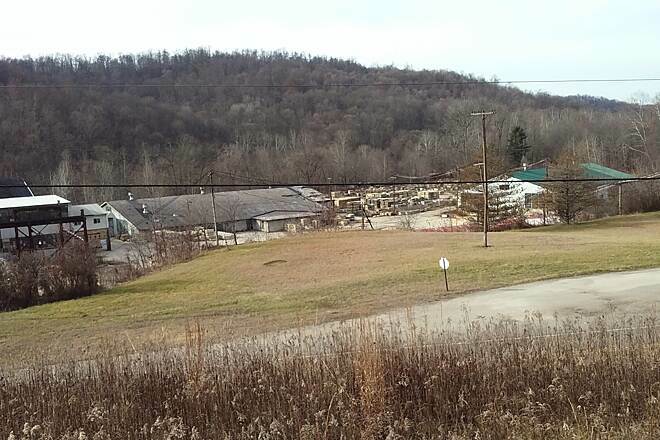 Rabers has a full shop a couple of miles north of Millersburg (on 241), and we were very happy to have stopped in. Even test rode a 'bent! Fredericksburg has a corner snack shop (Lems), great ice cream! Highly recommend the trail and towns it intersects! 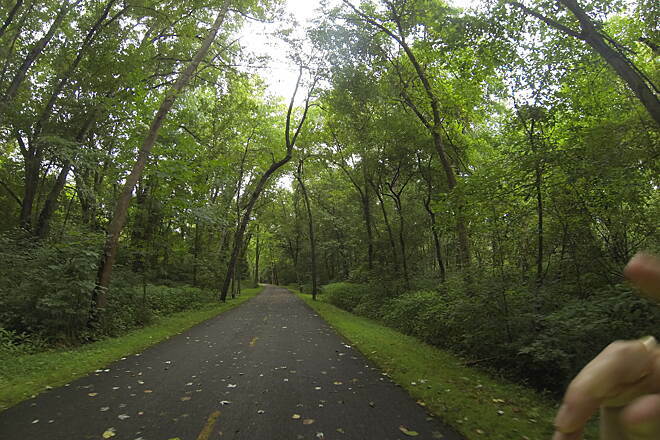 Just love this trail which I biked from Fredericksburg to Millersburg and back on 7/10/10. I loved the dual use aspect and had no problem whatever with the little presents the Amish horses left behind - almost always deposited on the buggy side of the trail. The carriage traffic is a unique and wonderful aspect of this trail. Appreciated the wetlands and wild flowers between Holmeville and Millersburg. We saw port a potties just south of Holmesville and of course they are available at the park near Fredericksburg school and at the depot in Millersburg. The young proprietor of Rabers Bike Shop in Millersburg was pleasant and helpful. Lunch at Millersburg Hotel very good. Amish were having a big get together at Fredericksburg with lots of food, volleyball, baseball. Fun to watch and sneaks a few pictures with my Amish buster lens. I look forward to exploring the southern section to Kilbuck. I've completed this trail numerous times and while it is a very very nice trail there are some lacking things that could make this an amazing trail like Kokosing. 1. Portapots - There were none to be found. 2. Clean up the horse poop.... I mean seriously it's like playing dodgems with poop even though there are seperate lanes. 3. Maybe a water fountain or two thats not off the beaten path. I know they seem like small complaints but it is what it is. Just come prepared. 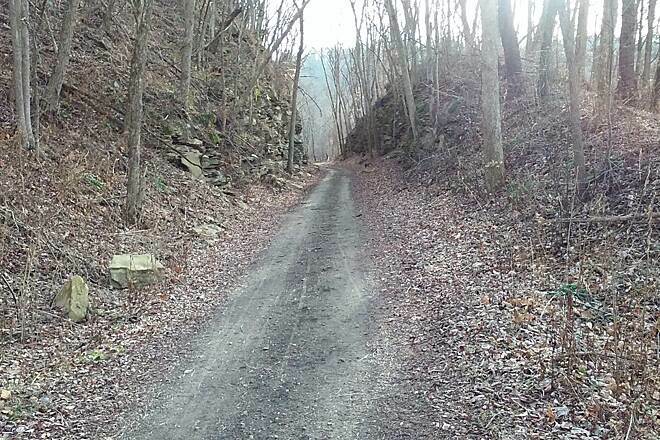 The Holmes County Trail is, for the most part, a wonderful trail to ride. 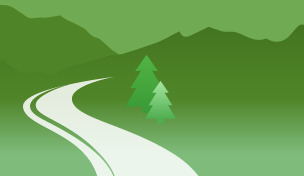 The scenery is beautiful, and the trail is in good shape. There are, however, a couple things to be aware of. 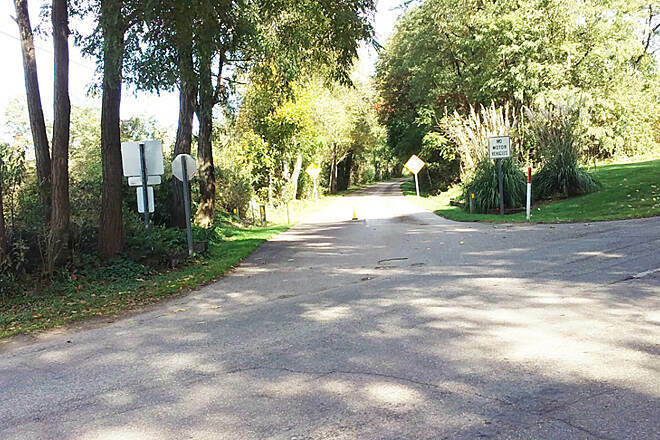 First - on weekends trail use is high, and the trail can get packed with people, especially around Millersburg. Second - while horses are supposed to stay on the chip and seal side of the trail, that doesn't always happen. No matter where you are on the trail, you have to watch for piles of horse manure. These road apples are everywhere. 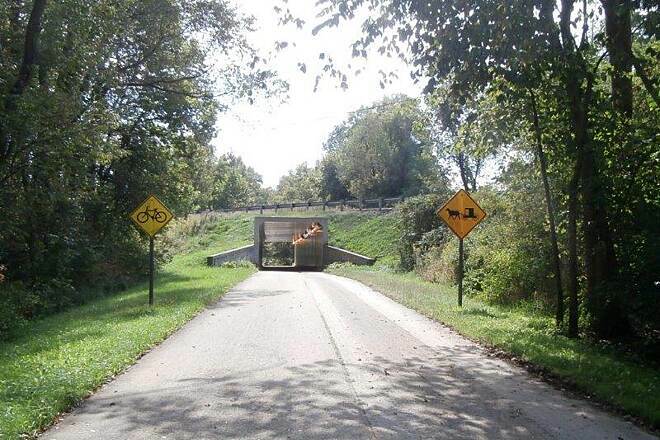 Believe me - riding through them is neither safe nor pleasant. It amazes me that a dog-walker has to pick up dog poop, but the Amish and others with horses on the trail leave big piles of manure where they fall, without consideration for other trail users. People who take horses on the trail should be required to carry a shovel to remove manure from the trail. We just finished riding this trail from Fredericksburg to Killbuck and have to say it is one of my favorite trails ever. We had a little bit of a hard time finding the north terminus, it turns out it is a school parking lot and the rest rooms are at the Little League field. One of the highlights was heading towards Holmesville and having an Amish horse and buggy turn onto the path and pass us. We have always loved this area but were worried that any road trails would be toooooo hilly, which they would be. 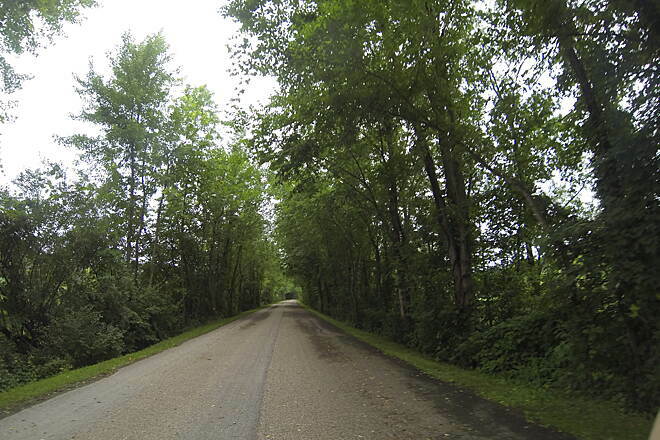 However, being a rail trail it has an extremely gentle grade that seems to head up as you go north. Nothing too scary though. Plenty of bogs along the way, turtles sunning themselves on logs, geese, ducks, early and late day riders will see deer, I was told. 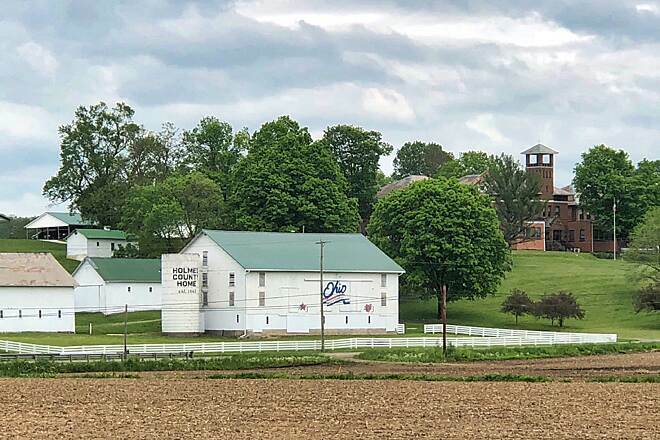 Another interesting thing we saw south of Millersburg was the cut-through to the local Walmart parking lot that the Amish use to get back and forth. All-in-all, one of our favorite trails and a wonderful 30mile trip. We will return! 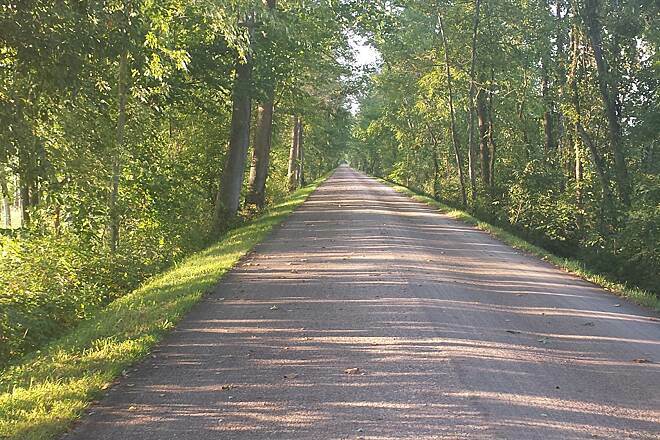 It was a hot August morning as we left Fredericksburg and headed south to Hipp Station in Downtown Millersburg on the Holmes County Trail. Set your GPS for the Fredericksburg Elementary School. 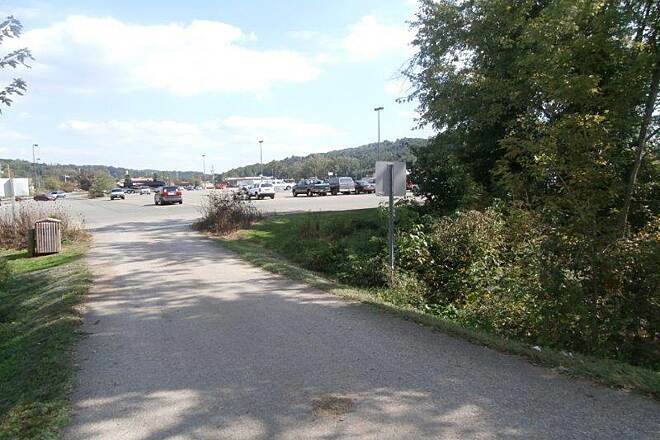 Parking is in the gravel lot adjacent to the school and baseball fields. The trailhead is to the left 200 feet just across a small bridge. The tail is unique. 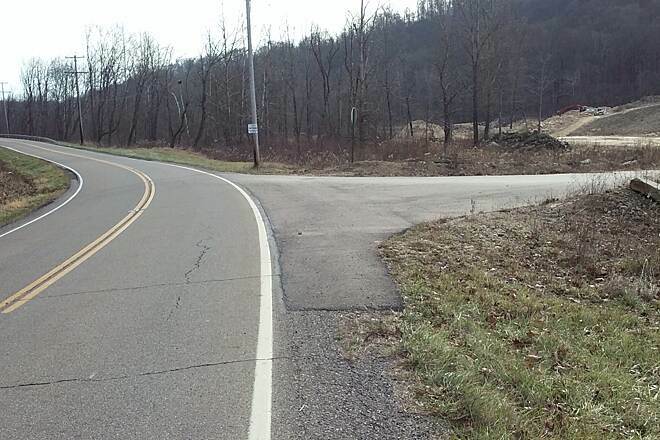 It’s generally the width of a two laned country road. 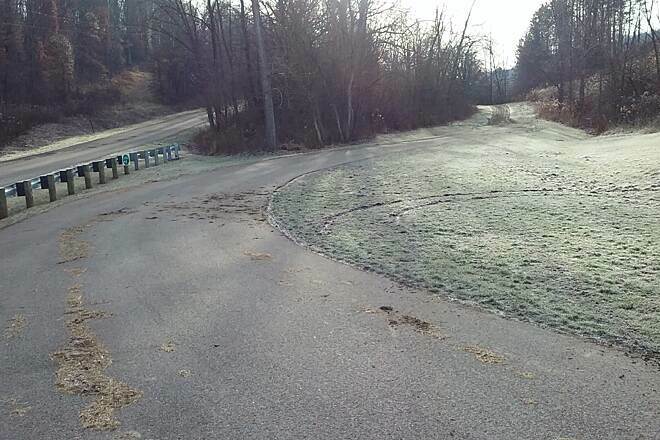 One side is asphalt paved for bicycles and the other chip and seal for horses and buggies. The traffic was very light most of the trip. This allowed us to use both lanes. 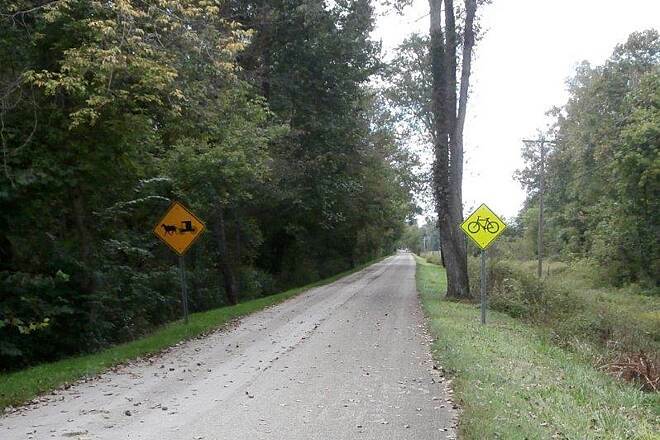 The only caution is that the lanes may differ in height and shift sides. So, watch out for the 1”-2” center drop and change in traffic pattern. The trail condition was very good. With horses sharing the trail, you occasionally encounter road apples (horse manure). Just remember to keep your eyes ahead and down. 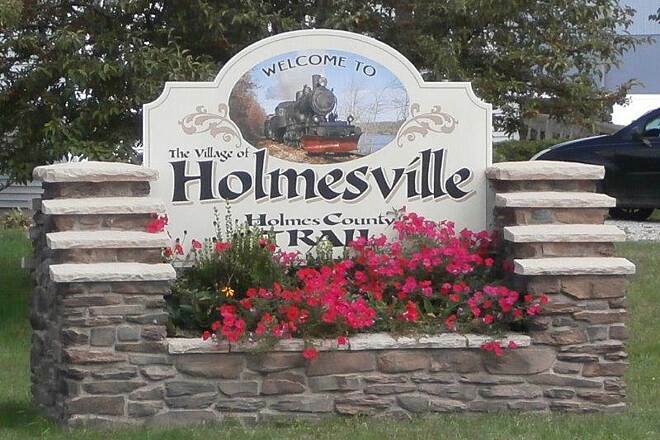 About 5 miles south of Fredericksburg you enter the village of Holmesville. The trail follows a few village streets for about a ½ mile before re-entering the trail. This was no issue since it is well marked and the streets were level and in somewhat decent condition. 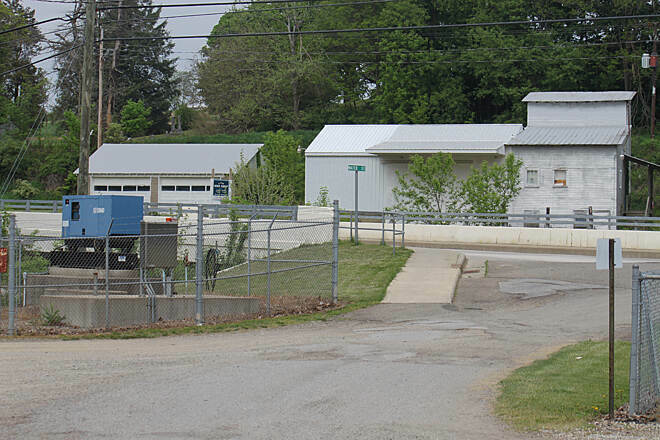 Hipp Station in Millersburg sits just north and west of downtown. 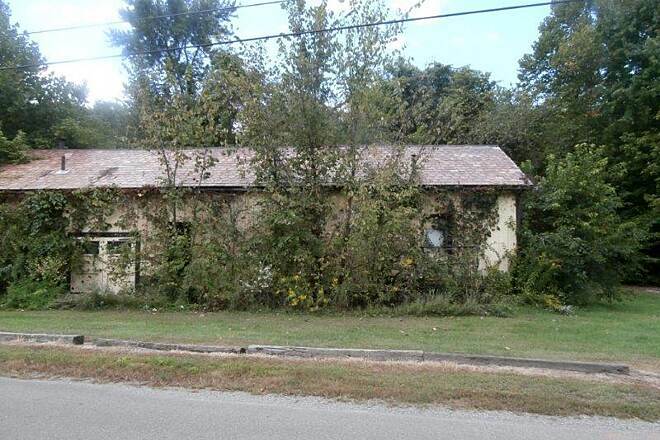 It’s an easy 3-4 block walk to the center of town. 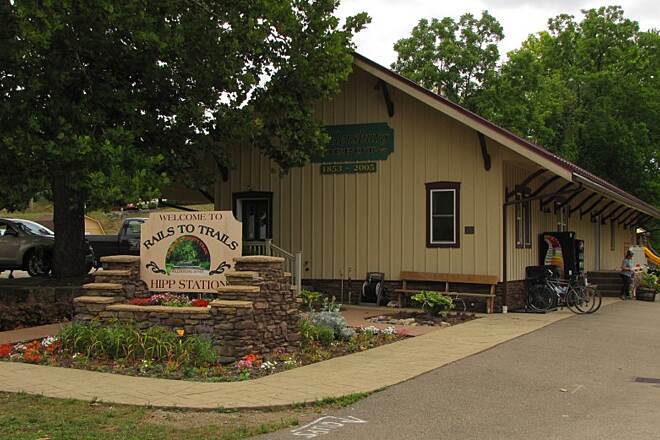 The station is the headquarters for the trail and a visitor’s information center. We were surprised that it was closed on a summer Saturday. There was a small bicycle shop in the station. It had a nice assortment of accessories at decent prices. There is little dining along the trail other than Millersburg. We opted for a sports bar on the main drag across from the courthouse. We passed a Hotel, Mexican restaurant and pizza parlor along the way. Actually the pizza parlor is a good option. It’s just a block east and a block south from the station. 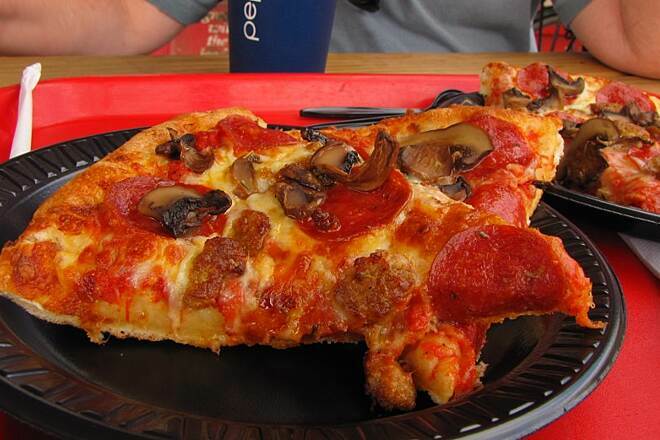 We might get a carryout pizza on our next ride and take it back to the station. There is a very nice pavilion with ample space adjacent to this trailhead where you can rest and eat. Many people continue south from Millersburg for another mile or so. There is a Wal-Mart, retail stores, grocer and several dining options in that area. We did not venture that far south and can’t actually speak to what is there. This trail is a good one for beginners. It is mostly flat. It does head downhill to Millersburg. The grade back to Fredericksburg was pretty gentle and no big deal. It does not have benches or picnic tales along the route. There are ample areas of shade to stop and rest. 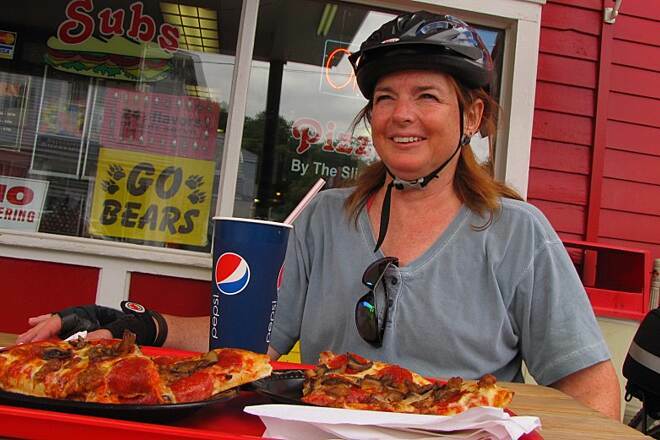 Fredericksburg is a small village and has a pizza parlor and restrooms near the trailhead. 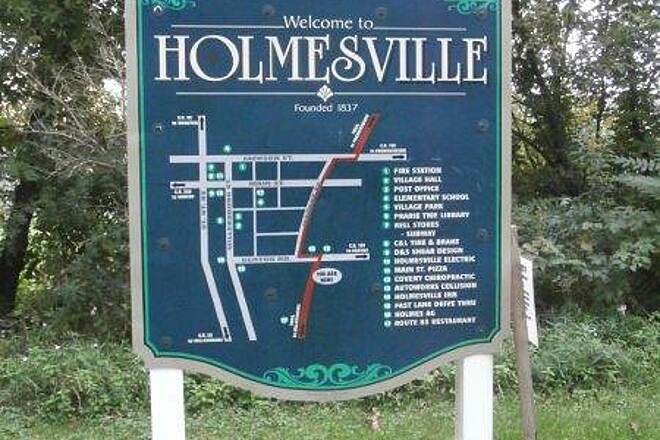 We did not see the retail area of Holmesville. I suspect it is very small. Millersburg is your best bet for dining. I rode the Holmes Trail yesterday as part of the Annual Fredericksburg Roll Library Fundraiser. This trail is great and is neat how you share it with the horse and buggies (look out for the road apples). The trail is very flat and mostly shady. Each year they lengthen the trail a little bit more. When done it will connect to the "Bridge of Dreams" in Binkhaven. 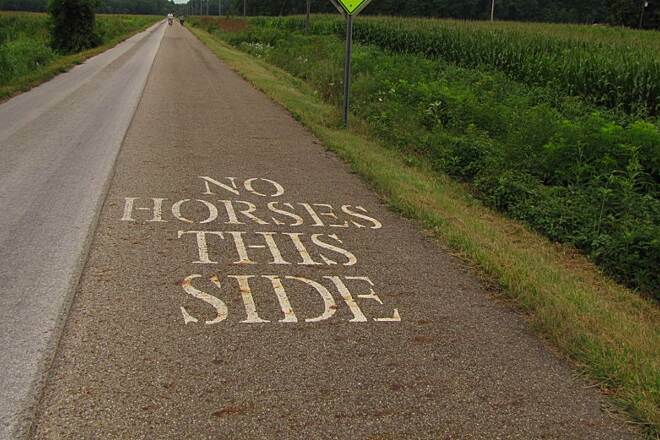 "I agree it is a very nice trail, but the horses' steel shoes have created little divots in the middle of the skating surface. Consequently, the vibration of the rough surface is transmitted into the skaters (mine!) feet and takes away some of the goodness of the trail." 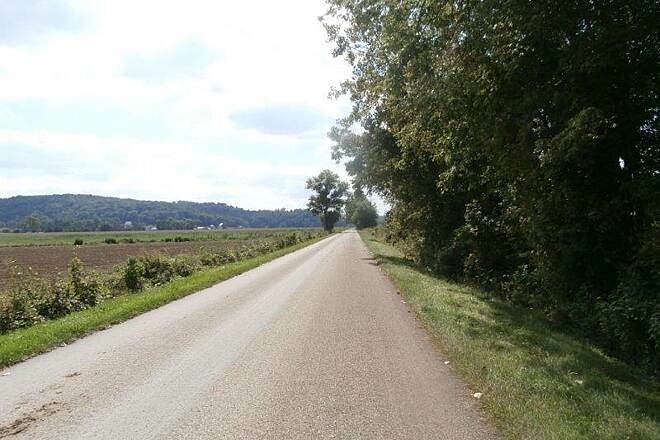 "I rode the section from Fredericksburg to Walmart just South of Millersburg and it is beautiful, paved all the way. 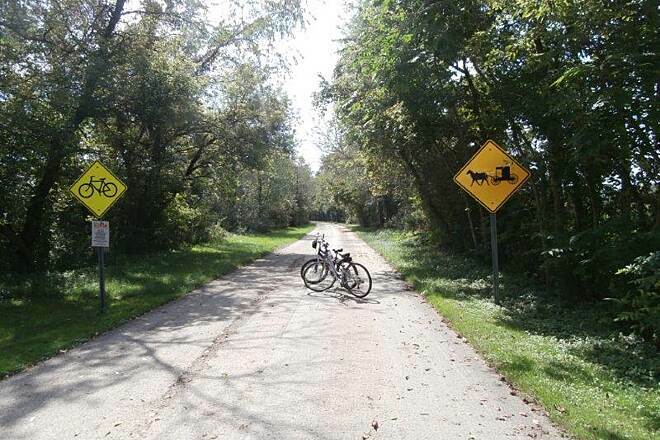 Share the trail with Amish horse and buggies. This section is 11.5 miles one way. South of Walmart the trail is not paved and fairly rough. I was told construction on that end of it is to begin spring 2007"
a slice of pizza at Lem's Pizza Shop. There are NO SIGNS in town directing you to the trail. 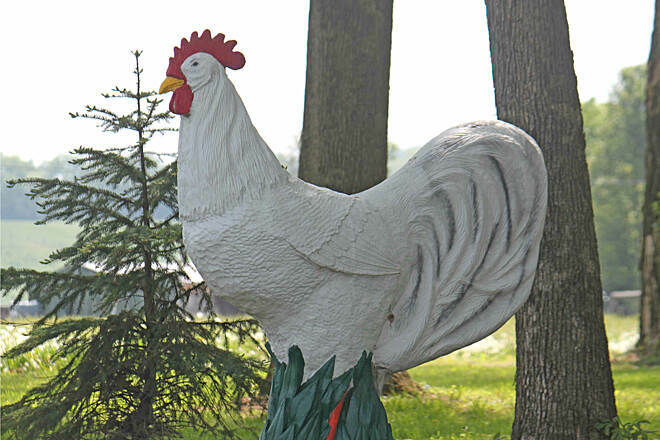 From the traffic light in the center of town, go South about 1/2 mile to Mrs. Millers Home Made Noodles on your right. Turn right there and go 1 mile to Sterling street. 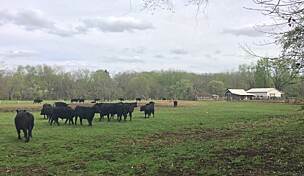 You will see a big farm with a white split-rail fence around the whole farm at Sterling Street. Go 1/4 mile on Sterling to the Trailhead. 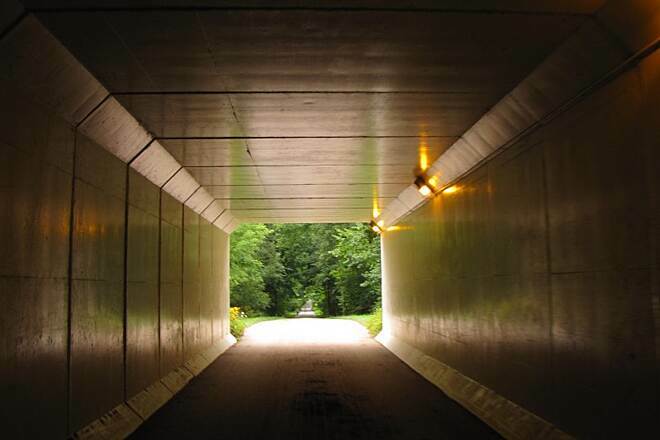 About the 5-6 mile marker, there is a clean, finished, well-lit tunnel. Immediately after the tunnel, turn left into a path that goes up hill to Skip's Trail Depot for an excellent lunch. I stopped there for lunch and a flea market. I bought a Daimler, 21 speed, ladies' bike for $20 in very good condition. The seller held it till I could get back with my car. The 21.8 mile trip took 5 wonderful hours including a yogurt parfait at McDonald's near Wal-Mart. It's the best bike trip this year. I got some pictures I will post when I finish the roll of film. Yesterday we celebrated our 42nd wedding anniversary at a local Inn. We had heard of the unique features of the Holmes County Trail, so we brought our bikes with us in hopes of giving it a try before we headed home. We were not disappointed. It was a fun ride. We drove to the Walmart parking lot about 2 miles south of Millersburg on Route 83. 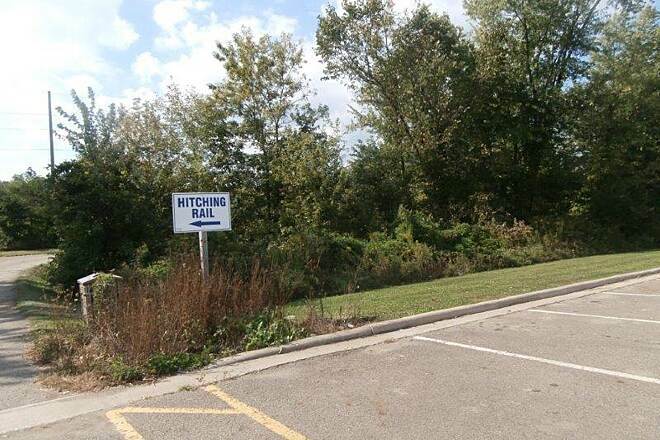 This is an excellent place to park and begin your ride. 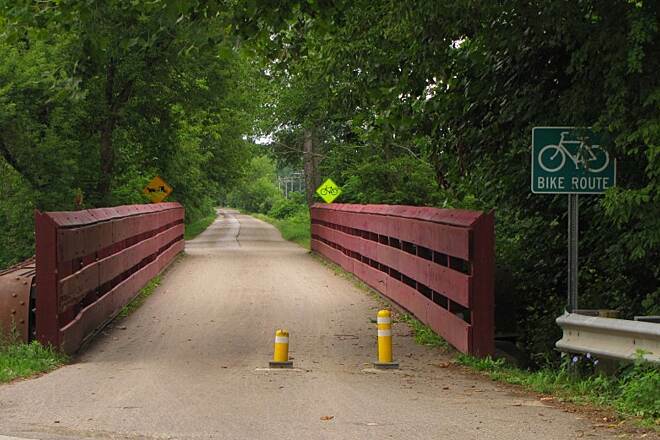 Right away you will notice that this is not your typical bike trail. Not every Walmart has a “Hitching Rail” and a covered barn-like building to house horse and buggies while their Amish owners shop. Please be aware that while the Amish are very friendly and happy to talk to you, because of their beliefs they may not want their pictures taken. Please ask first and respect their wishes. Just to the right of the Hitching Rail and buggy parking area is the entrance to the trail. Although the improved trail goes a short distance farther south, we did not go that way and can’t comment on that portion. We made a right turn and headed north. Since the trail mile markers start numbering from the north end, you will encounter decreasing numbers as you ride north. The first one we noticed was mile 10, a little over half a mile north of our starting point. It was in the mid 80’s with high humidity, but there was ample shade and it was more comfortable to be moving rather than standing still. 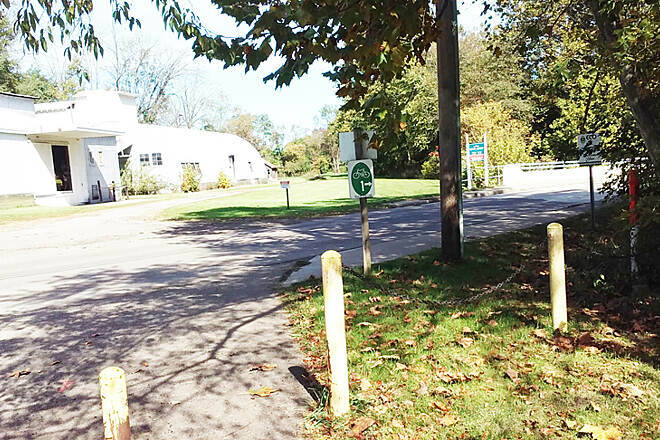 The trail is designed for both bicycle / rollerblade traffic and horse and buggy traffic. 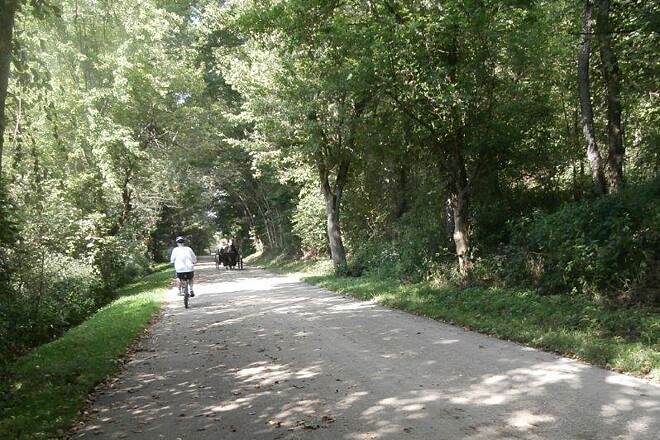 Some sections of the trail have a lane of asphalt and a lane of crushed limestone to be more horse friendly. It was not a busy day but we did encounter several horse and buggies, a rollerblader and occasional bicycles. 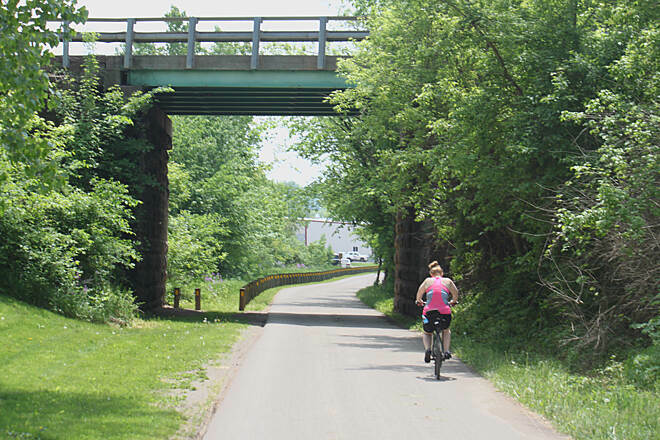 Like most rail trails, this one is quite flat, even though the Millersburg area has lots of rolling hills. The biggest incline we encountered was at the Route 83 underpass. Just before the Route 83 underpass there is the opportunity to make a right turn and go up the hill. This will take you to Skip’s Trail Stop. We stopped there for lunch (actually on the return leg of our trip). There are restrooms, cool drinks, and a large selection of lunch type items. The food was good (and inexpensive). It appeared that many locals eat there regularly. Skip has lots of railroad memorabilia displayed and is quite happy to “talk trains” if you have an interest. 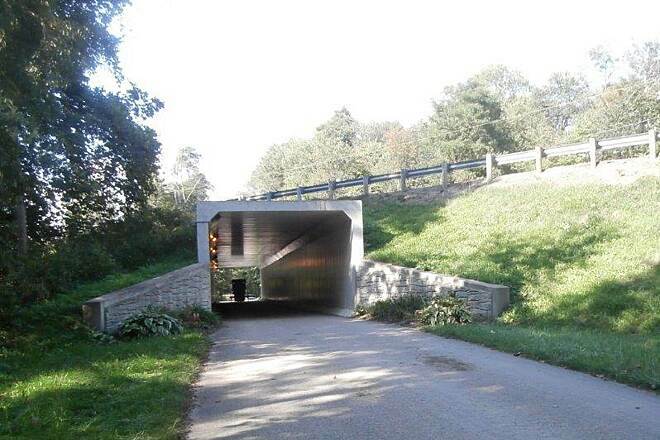 Continuing on north we went through the lighted underpass at Route 83 and continued on about 2 miles to Holmesville. 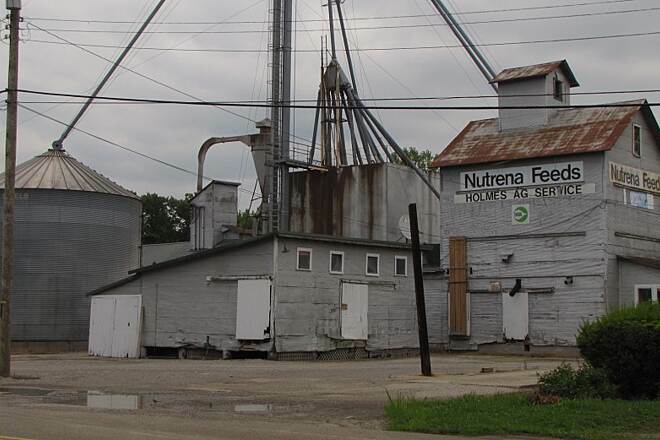 In Holmesville there is a small detour that goes around a grain elevator. It is well marked but is essentially a left, right , right, left and back on the trail. 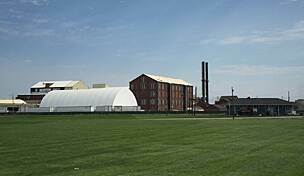 It appeared that the railroad had originally gone right through the grain elevator site but now we must go around it. Continuing on, we discovered that some sections of the trail are actually divided and on different levels - buggies lower and bicycles higher. All good things must come to an end. The current end of the improved trail came at the 10.68 mile point from our starting location. This is at Sterling Street just south of Fredericksburg. We heard what sounded like the whistle of a steam locomotive. Curious, we asked a gentleman who was walking his dogs if there were still steam locomotives in the area. 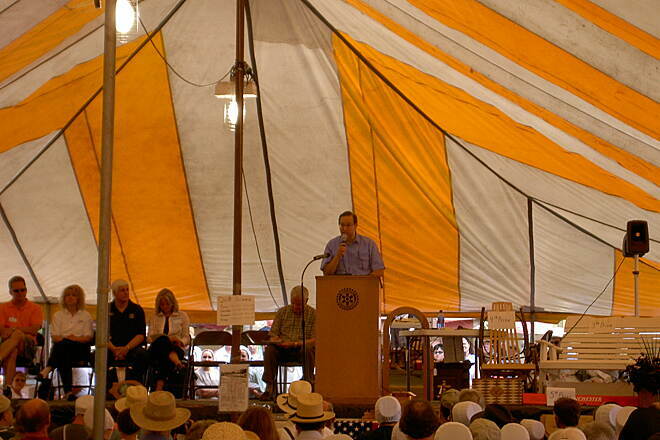 He said there was an Amish sawmill nearby that was steam powered and we were probably hearing the lunch whistle. Not every trail has one of those. 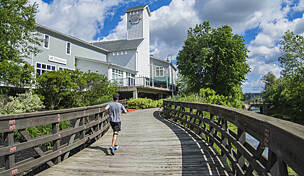 The trail was comprised of woodlands, farmlands, wetlands, and some suburban city areas. The scenery was most pleasant. It was a most enjoyable ride. 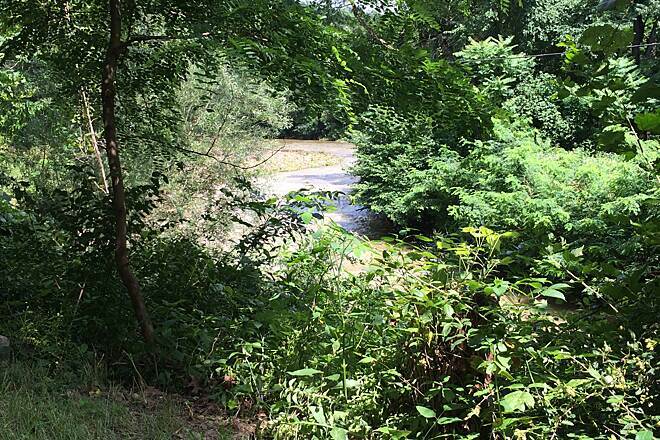 "My husband and I have been on this trail twice. It was a beautiful experience. 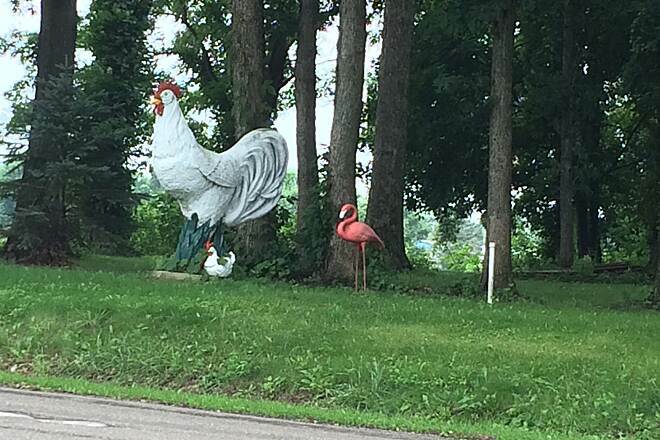 Not only did we see an eagle, lots of blue birds and wild flowers, but had fun watching the Amish buggies go by us. We even got to talk to them. They were on their way to the Wal-Mart Store. It has a lot of shade along the trail. The trail is about 13 miles long. 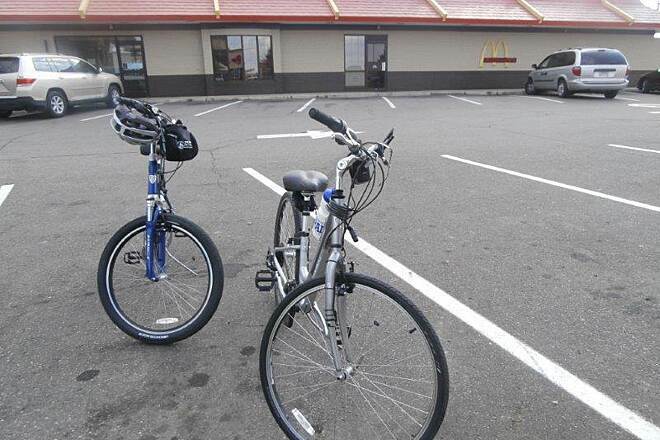 You get on the trail at the Wal-Mart parking lot and there are places to eat and stay close by. You must give this one a try. Ruth and John"
"I rode the Holmes County Trail last fall between Holmesville and Killbuck, on a beautiful sunny day full of fall colors. I understand the trail is constantly being upgraded, but at my last visit it was paved in the Holmesville area, dirt through Millersburg, and weed-grown ballast south of there. If you're going south of Millersburg (toward Killbuck), you definitely need a fat-tire bike, as the trail is quite primitive. Also, make sure you bring insect repellent, because the trail is bounded by swampland on both sides. Apart from those difficulties, the ride is beautiful and quiet...I encountered very few other trail users that day. 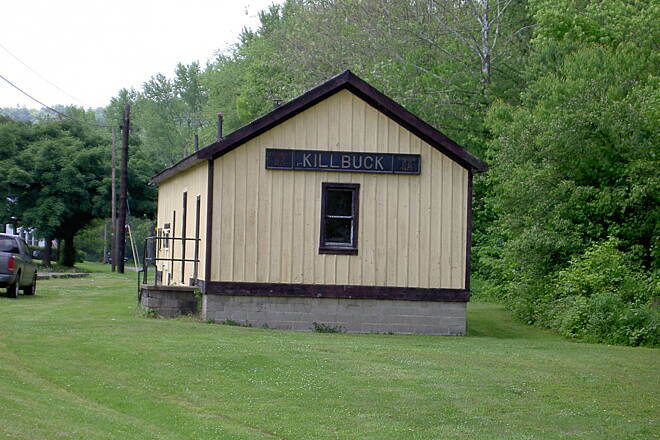 Fun note: the train station in Killbuck is still standing, with a sign telling you how far it is to Columbus. 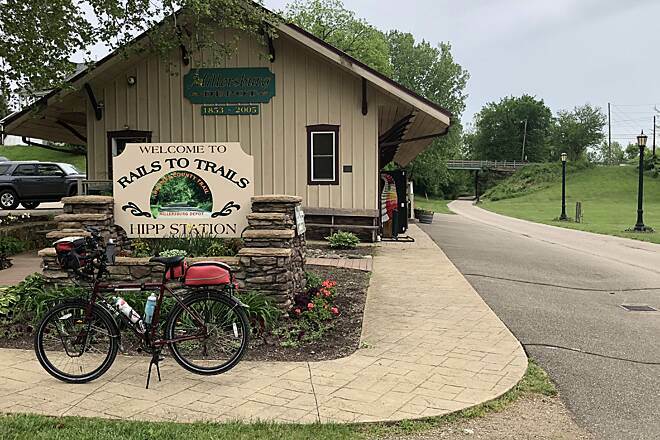 I'm certainly looking forward to when the trail is officially connected with the Mohican Valley Trail, etc., so it will actually be possible to bike all the way to Columbus on the rail-trail." "I discovered this trail today (Jan 11, 2004) while ""Geocaching"" (an adventure game for GPS users), and I will most definitely be back in the spring, if not sooner, with the family and the bikes. As a resident of Green, OH (Summit County), it's a long drive to the trail but looks to be well worth the trip. I will post photos after my first ride. 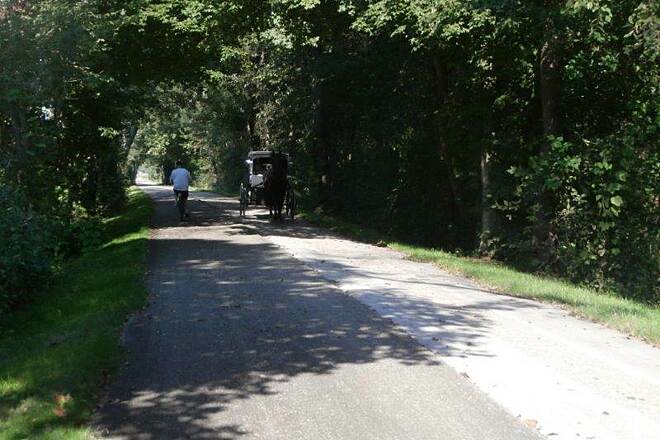 The best part of this trail is that you might encounter an Amish family in a horse drawn buggy. This is a great trail -- it's very wooded on each side. 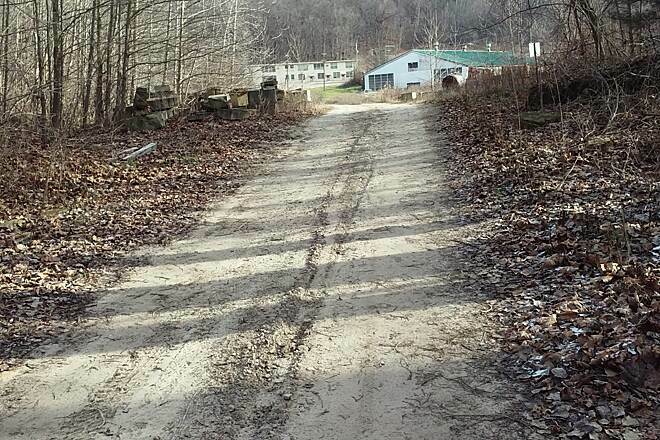 "We took our miniature horses hooked to carts on this trail a few times now and are addicted! This is a lovely trail, and the horses seem to really enjoy it. So did we!"